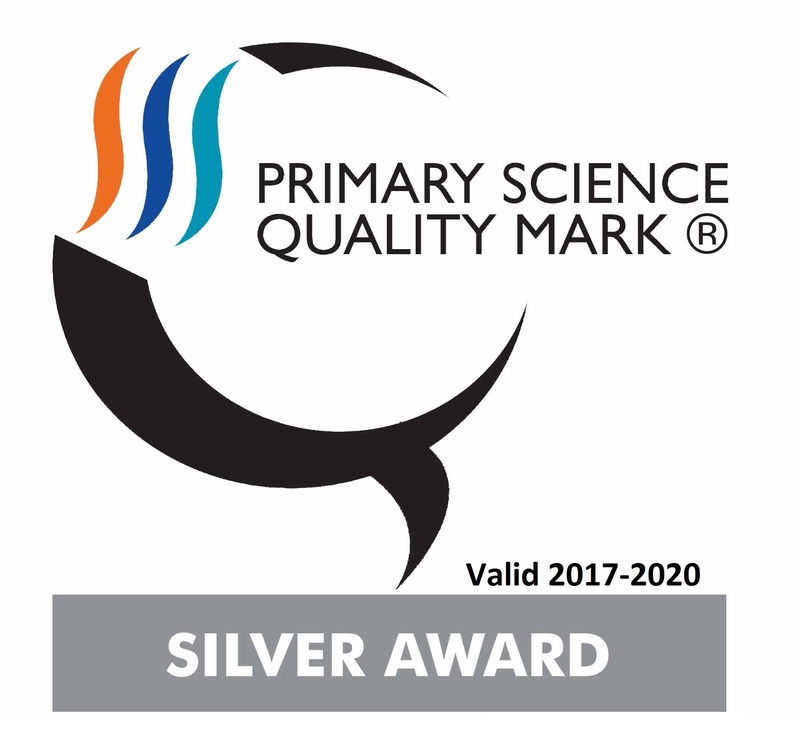 To find out more about Year R’s curriculum, please click on the current newsletter below or speak to you child’s class teacher / Year Leader (Miss Dinham). 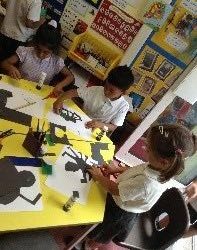 Literacy: This week, we have continued with the story of ‘Stick Man’. 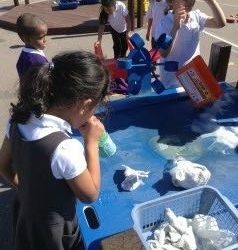 We have looked at different types of water. 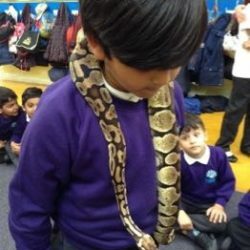 Can your children tell you the difference between them and what animals they might find there? 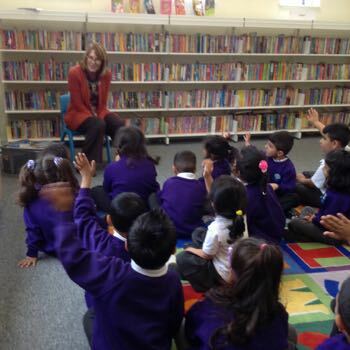 This week we are beginning to look at a new story called ‘Tiddler’ by Julia Donaldson. Every day, Tiddler is late for school, and every day he has another tall tale for his teacher. But did he really ride a seahorse? Did he really meet a mermaid? And who will believe him when he really does get captured in a net? 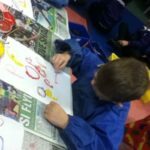 Phonics: In Miss Dinham’s and Miss Wareham’s class we have been learning the sounds ou and oy and writing words using the digraphs. 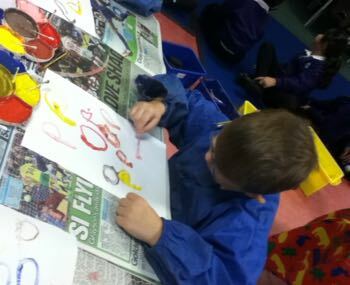 In Mrs Hicks’ class we have been learning oo (moon) and revising all the other sounds. 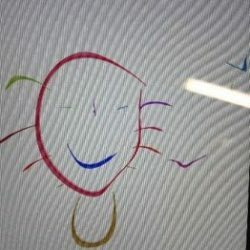 In Miss Harrison’s class we have been revising ay and revising all the other sounds. In Mrs McIntyre’s class we have been revising l and h; forming them correctly and using them to create cvc words. 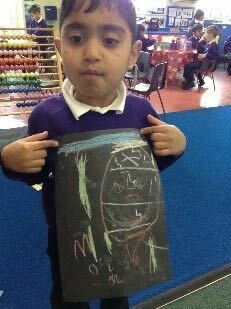 In Miss Hussains’s group we have been revising l and h; forming them correctly and using them to create cvc words. 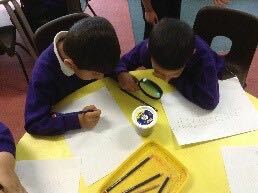 Maths: This week we’ve been learning to estimate amounts of objects and then check to see if our guesses were correct or near to the actual amount. 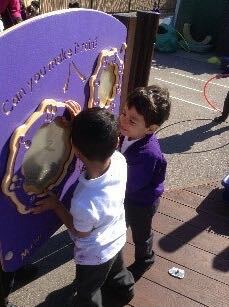 We’ve also been learning to use the language of time and have really enjoyed playing What’s the time little Tiddler? 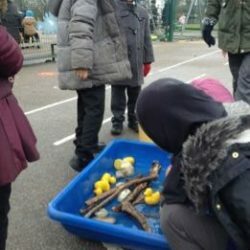 Outdoor, Creative and UW: Both outside and in our classrooms we’ve been finding out about which objects float and which sink. 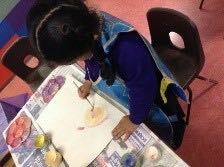 At the end of the week we focussed on the story of Tiddler and have been painting, drawing and making models of creatures who live in the sea. 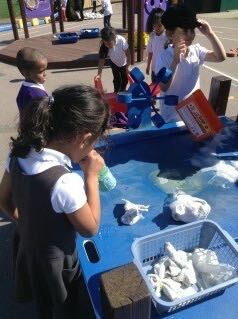 We’ve also been finding out facts about the sea and life within it. 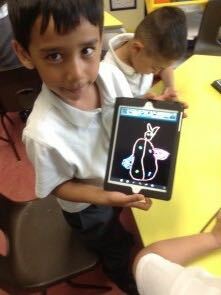 We found out that there are some amazing creatures that live deep in our oceans, such as the Leafy Sea Dragon. This creature resembles a sea horse but also looks like a plant! There’s also a creature called a hairy frogfish, which can change colour to match the environment in which it lives. 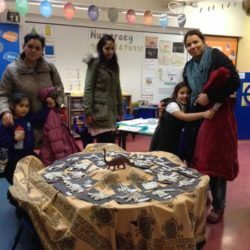 To celebrate our work this term we invited our parents and carers to come and see our wonderful creations. 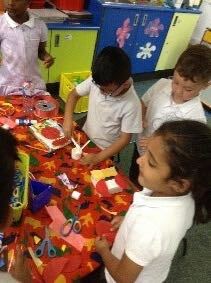 We really enjoyed showing then explaining how we made them. 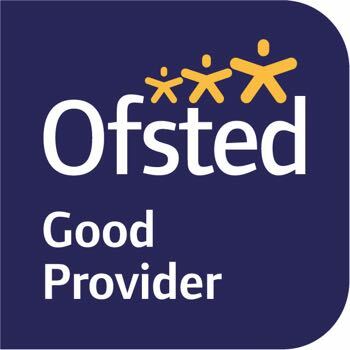 We are all very proud of our achievements! 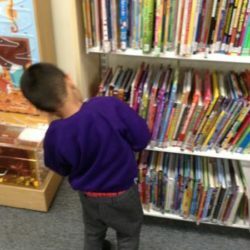 We went to the library this week. It was a great opportunity for us to learn about all the excellent resources within the library and how using these can make a real difference to our learning. 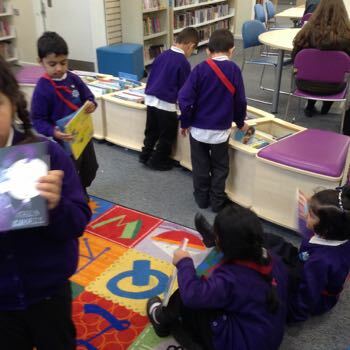 We had lots of fun meeting the librarian, listening to stories and choosing books. 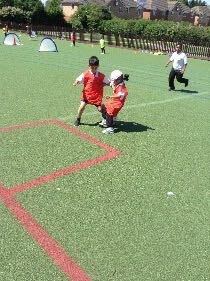 Now we will be encouraging our parent to take us! 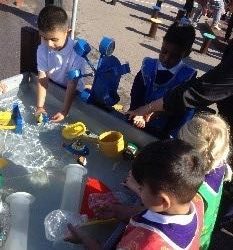 We had great fun on Recycling Creative Day. 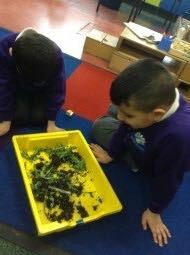 We discussed the area we live in and how we can care and look after it by recycling items. 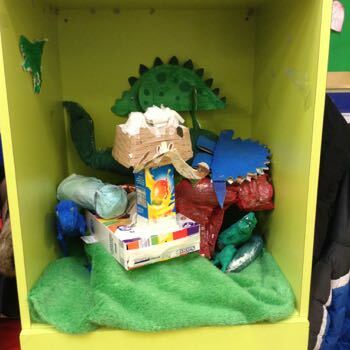 We used various everyday objects to make models and puppets to tell stories. 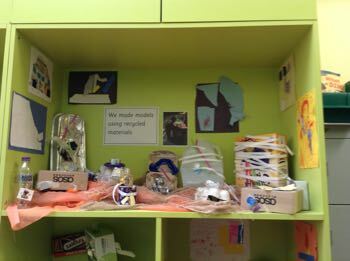 It was wonderful to use recycle materials that we would normally throw away to make something else. 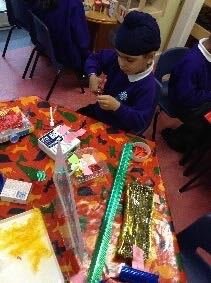 This week we have started to look at the story of ‘Stick Man’ by Julia Donaldson. We are getting to grip with the vocabulary used in the story. 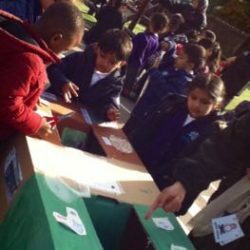 Can your children remember any of the words that they have learnt? 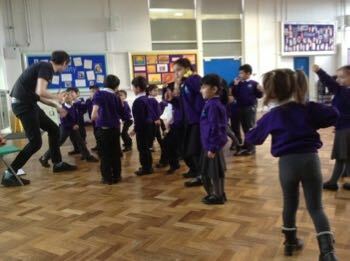 In Miss Dinham’s and Miss Wareham’s class we have been learning the sounds air and ir. 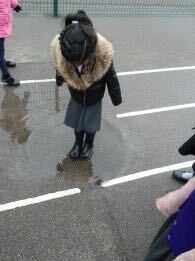 In Mrs Hicks’ class we have been learning ow (snow) and revising all the other sounds. In Miss Harrison’s class we have been revising ch, sh and th and using them in cvc words. In Mrs McIntyre’s class we have been revising f, e; forming them correctly and using them to create cvc words. 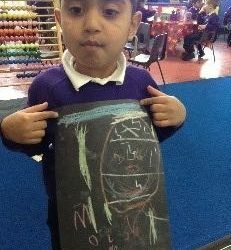 In Miss Hussains’s group we have been revising f, e; forming them correctly and using them to create cvc words. We have continued to look at 1 less this week. 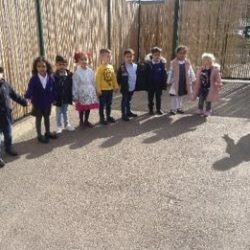 We have also started to learn about length this week and having been comparing the length of different sticks to find the longest and shortest. 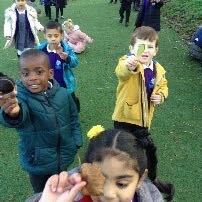 Outside we’ve been hunting for sticks and using them in our activities. 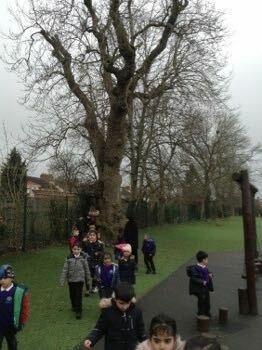 We’ve also been looking closely at trees and noticing their different heights. 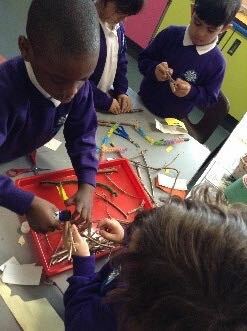 We’ve had fun using real sticks to make Stick Man and then building new houses for him and his family. 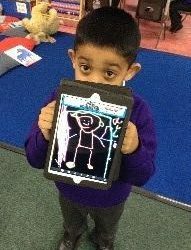 We’ve also drawn and painted some super Stick Man pictures. You could continue hunting for sticks with your child in the park or in your garden, and then use them to make pictures and models. Literacy: This week we have been reading The Gruffalo’s Child and finding out about what happened when she met the Big Bad Mouse. 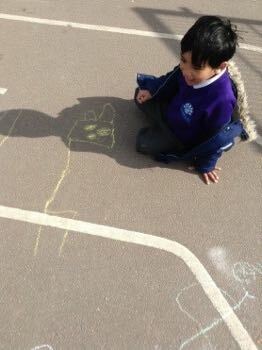 We’ve also been talking about the Big Bad Mouse’s features and character. 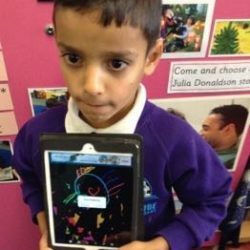 Phonics: In Miss Dinham’s and Miss Wareham’s class we have been learning the sounds ar, or and ng. In Mrs Hicks’s class we have been learning ng and revising all the other sounds. In Miss Harrison’s class we have been learning sh and ch and using them in cvc words. 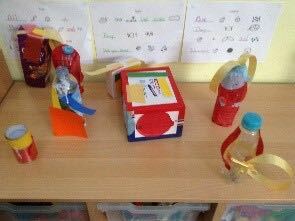 In Mrs McIntyre’s class we have been revising the single sounds; forming them correctly and using them to create cvc words. Maths: In maths this week we have been revising 3-D shapes. We have looked at cubes, cuboids, spheres, cones and cylinders. 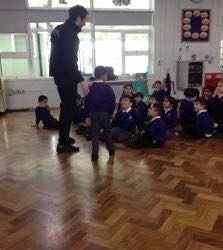 We also spoke about the days of the week and how we do certain activities or lessons on particular days. Outdoor and Creative: Outside we’ve been acting out the Gruffalo’s Child story and looking for the Big Bad Mouse in the trees around our playground! 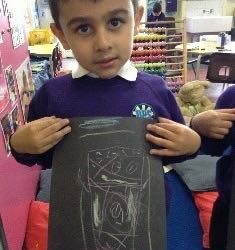 We’ve made the Gruffalo and his Child by drawing around around 2D and 3D shapes. 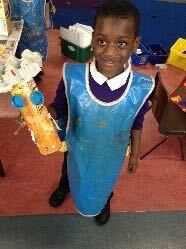 We’ve also painted, drawn and modelled them, both from recycled materials and from clay. 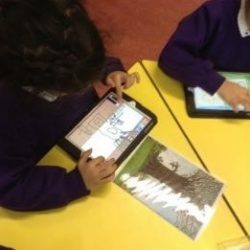 Literacy: In topic this week, we have been reading “Owl Babies.” We’ve also been finding out about real owls and have written some owl facts in our writing books. Phonics: In Miss Dinham’s and Miss Wareham’s class we are learning the trigraph “igh” and the digraph “ow”. In Mrs Hicks’s class we have been learning ‘ee’ and revising all the other sounds. 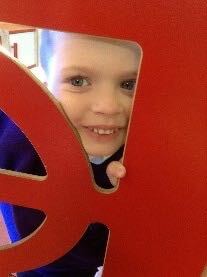 In Miss Harrison’s class we have been revising ‘a’ and ‘e’ and using them in cvc words. 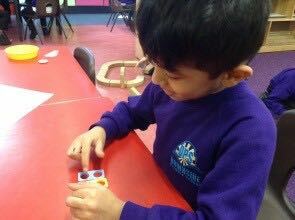 In Mrs McIntyre’s and Miss Hussain’s class we have been revising the initial sounds, forming them correctly and using them to create cvc words. 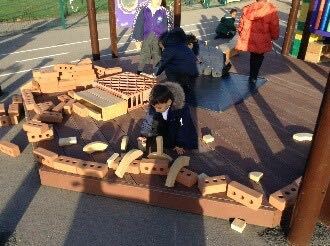 Maths: In maths this week we have been learning all about 3D shapes and trying to spot examples of them in our classrooms and playgrounds. 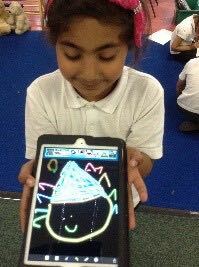 We have also revisited 2d shapes (triangle, square, rectangle and circle) and their properties. 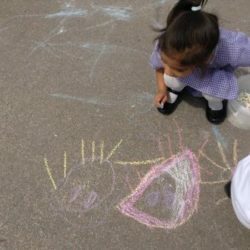 Creative Development and Outdoors: We’ve had a really creative week! 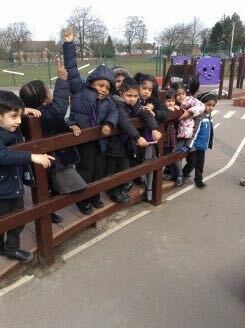 Outside we’ve been acting out the Owl Babies story and have tried to balance as perfectly as Bill, the baby owl. 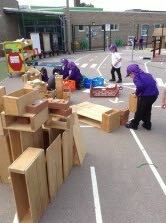 We also made huge owl nests out of boxes and had fun playing in them. We’ve learned a lot of facts about owls this week and are fascinated that they can turn their heads almost completely around. Did you know that a group of owls is called a parliament? 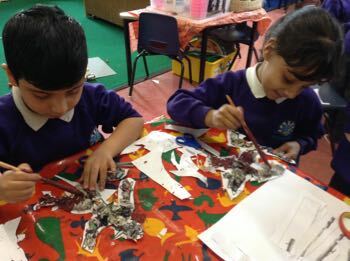 We’ve really enjoyed creating owl representations and have used real feathers in some of our work! 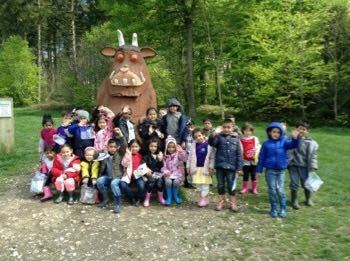 Literacy: In topic this week, we have continued to learn the story or ‘The Gruffalo’. We are using our story map to retell the story. Also, we have made scrambled eggs. The children have written a recount of how they made them using the past tense. 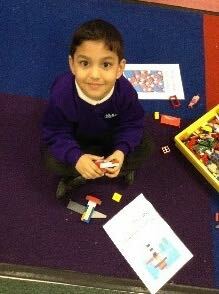 Phonics: This week we have started our new phonic sets and are continuing to read and write words. 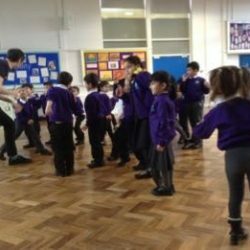 In Miss Dinham’s and Miss Wareham’s class we are learning the sounds ‘ay’ and ‘ee’. In Mrs Hicks’s class we have been learning ‘ay’ and revising all the other sounds. In Miss Harrison’s class we have been revising ‘r’ and ‘h’ and using them in cvc words. 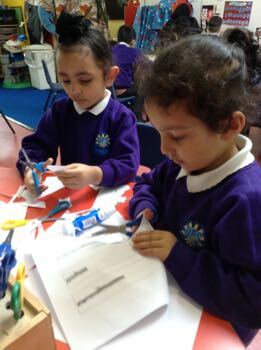 In Mrs McIntyre’s and Miss Hussain’s class we have been revising the first 5 sounds,‘t’, ‘i’, forming them correctly and using them to create cvc words. Maths: This week in maths we have continued to work on finding the total of two groups. We have been introduced to the addition sign and have been practically solving questions such as ‘3 + 2 = ’. 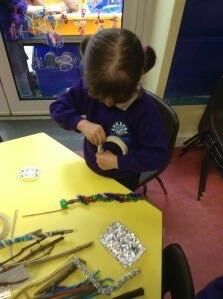 Creative Development: This week we’ve been making some of the funny foods from the Gruffalo story. We made mouse on a slice of bread, snake sandwiches, fox on toast and owl ice cream! 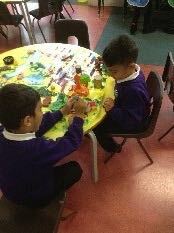 We’ve also been having Gruffalo tea parties in our role play areas. 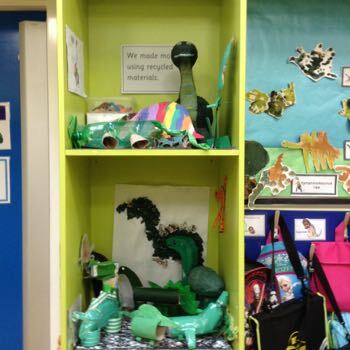 We made some super models of the animals in the Gruffalo story, using recycled materials. Perhaps you could make an owl, fox, snake or mouse at home with your child. 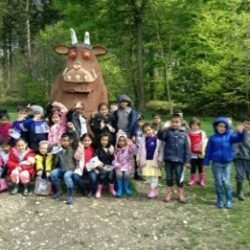 Literacy: We have been continuing to read The Gruffalo. 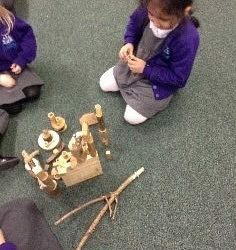 This week we have been focusing on the different animals in the wood. 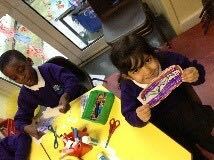 Phonics: This week we have continued to work in our phonics sets and are continuing to read and write words. In Miss Dinham’s and Miss Wareham’s class we are learning the double sounds. In Mrs Hicks’s class we have been learning ch and th and revising all the other sounds. In Miss Harrison’s class we have been revising v and j and using them in cvc words. 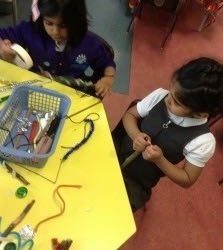 In Mrs McIntyre’s and Miss Hussain’s class we have been revising the first set of sounds, forming them correctly and using them to create cvc words. Maths: We have been finding the total of two amounts this week. We started off by discussing how total and altogether mean the same. 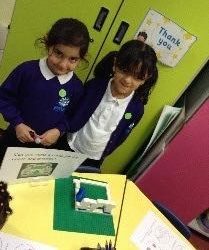 We have then been finding the total of two amounts using numicon. 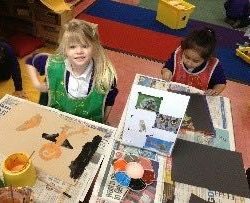 Outdoor Learning and Creative Development: We’ve been making pictures and models of the Gruffalo and of the animals in the story. 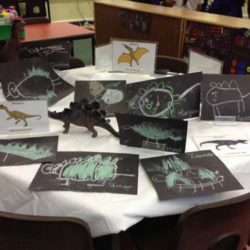 We drew pictures from looking at photos of real animals, and also from looking at Axel Scheffler’s illustrations. We talked about the similarities and differences that we noticed. 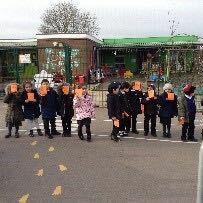 Outside we’ve been learning about positional language. 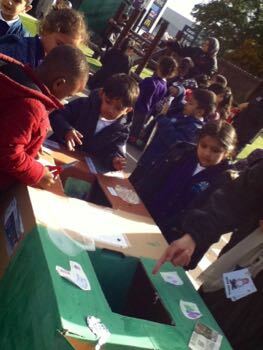 We looked everywhere for the Gruffalo and finally found him hiding behind the big box! Literacy: This week in topic we have been looking at our new story. It is called ‘The Gruffalo’. The children are beginning to understand the narrative of the story with the help of our story map. Can your children tell you what happens in the story? 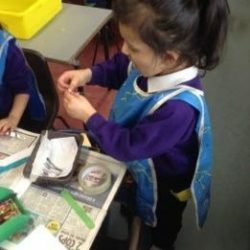 In Miss Dinham’s and Miss Wareham’s class we are learning the sounds ch, sh and th. In Mrs Hicks’s class we have been learning ch and revising all the other sounds. In Miss Harrison’s class we have been revising y, w, z and x and using them in cvc words. 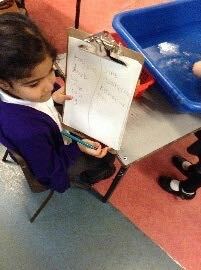 In Mrs McIntyre’s and Miss Hussain’s class we have been revising the first 5 sounds, m, a, forming them correctly and using them to create cvc words. Maths: We have continued to work on height this week and making sure we have been using the correct vocabulary (short, tall, shortest, tallest). We have also been ordering by height. 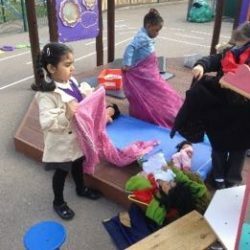 Outdoor Learning and Creative Development: This week we’ve been drawing, painting and making models and puppets of the Gruffalo and other characters in the story. 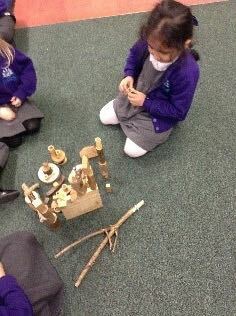 Outdoors we’ve been having fun making the different woodland homes that the animals in the story live in. 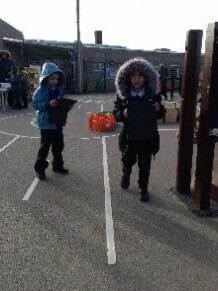 We also went on a number hunt. 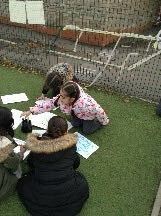 When we found allour numbers we then had to think hard about how numbers are ordered. Phonics: This week we have been learning ‘qu’ and revising all the sounds that we learnt last term. 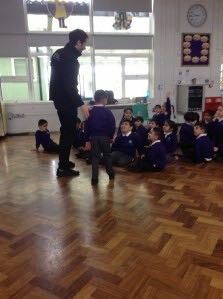 Maths: We have been learning about height this week and have been introduced to the words short and tall. 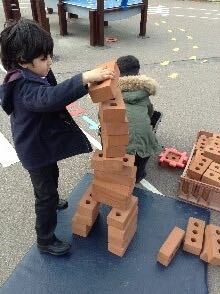 We have been building towers and comparing the height of them to see which is the tallest and which is the shortest. 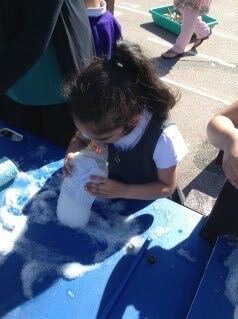 Outdoor Learning and Creative Development: This week we’ve been drawing, printing and painting ourselves as snowmen. We’ve made snowmen from dough, clay and lego, and also with recycled materials. 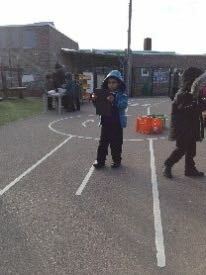 Outdoors we’ve been having fun hunting for, and then taking photos on our ipads of tall and short things. 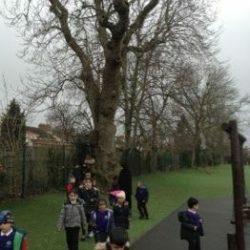 We’ve also taken lots of photos on our winter walks on the school field. Look at this tall winter tree! 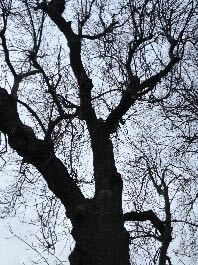 Isaac took the photo and said he could see the sky through the branches. Literacy: This week we have continued to read and learn the story map of ‘Hansel and Gretel’. 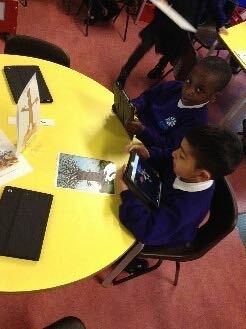 We have also looked at the book, read the story and looked carefully at what is happening in the pictures. Phonics: This week we have been learning the sounds y and w and we have begun trying to write simple words. Try and see if your child can write or read web, yak, wed, yup, win and went. 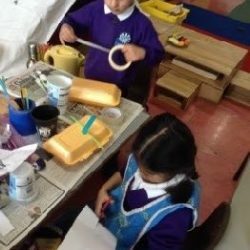 Maths: During maths we have been revisiting our previous learning. We have looked at weight, one more and shape. 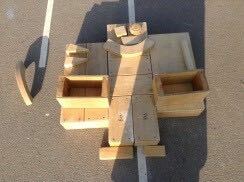 See if we can spot any shapes at homes. 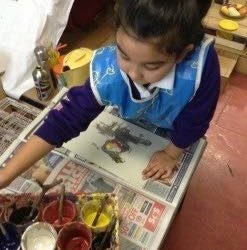 Creative and outdoors: This week we’ve been busy printing the witch’s gingerbread house and then decorating it with sweets and acting out the story of Hansel and Gretel. 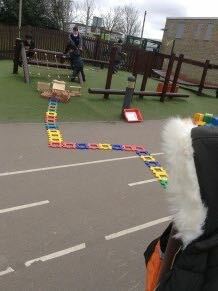 We’ve had fun experimenting with making trails, both in our classrooms and in the playground. 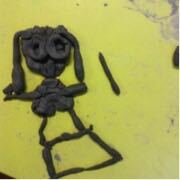 We also used clay and playdough to model the witch’s house and the story characters. 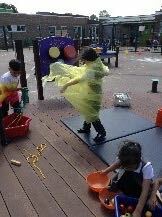 Outdoors we’ve been having fun using the parachute, and role playing the story of Hansel and Gretel. Literacy: In literacy this week we have looked at a simple story map of ‘Hansel and Gretel’. 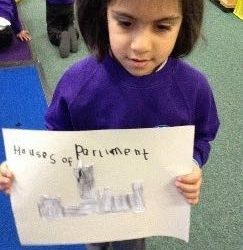 We have learnt the how to tell the story and use actions to help us remember it. Phonics: This week we have been learning the sounds r, j and v and we have begun trying to write simple words. 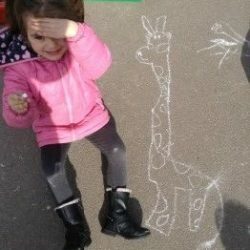 Try and see if your child can write or read rug, jug, van, red, vet, vent and jump. Maths: During maths this way we have been learning about one more and weight. 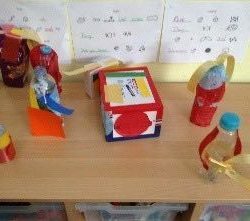 We have been using objects to add one more and to help us work out what is one more than a number e.g one more than 5 is 6. 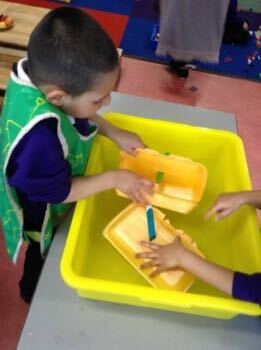 We have also started to learn about weight and have been using heavy and light to describe differences in weight. 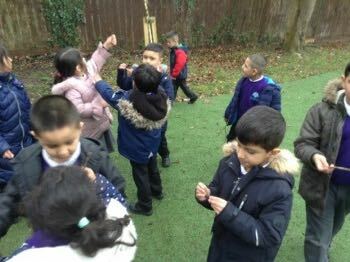 Creative and outdoors: This week we’ve been acting out the story of Hansel and Gretel. 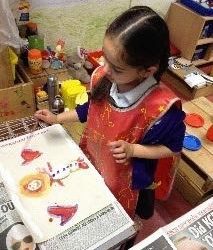 We’ve been drawing and painting the story characters and the gingerbread house. 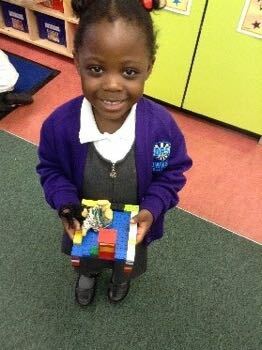 We used lego and other construction materials to make the witch’s house and a cage for Hansel. 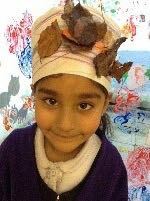 Outdoors we went on an Autumn walk and then made our own Autumn crowns. 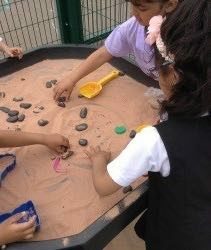 We also made pebble trails across the playground, just like Hansel did. 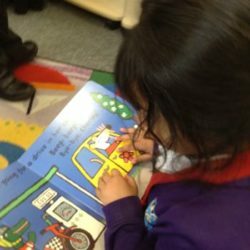 Literacy: This week we have been reading ‘Puss in Boots’. We are beginning to answer questions in order to understand the story. 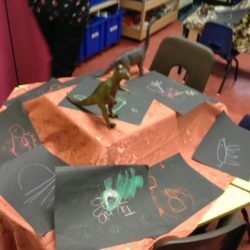 Can your child tell you what happens in the story? 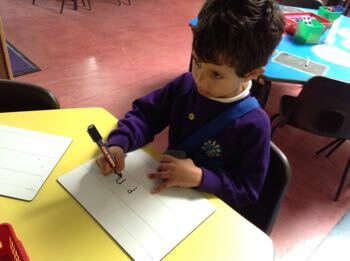 Phonics: This week we have been learning the sounds l and h and have begun trying to write simple words. 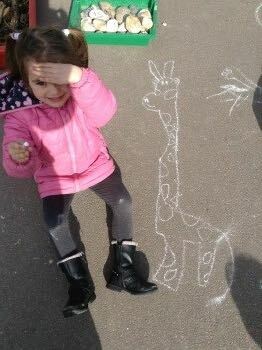 Try and see if your child can write or read hug, leg, hat, log, hip and lit. Maths: In maths we have been talking about height. 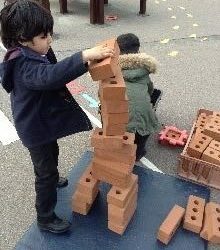 We have been being building towers of different heights and using short and tall to describe them. 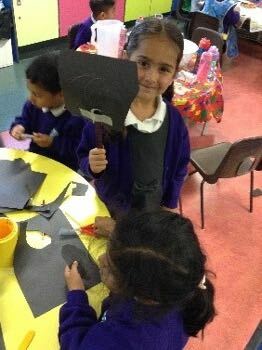 Creative and Outdoors: This week we’ve been making Puss in Boots stick puppets and using them to act out the story. 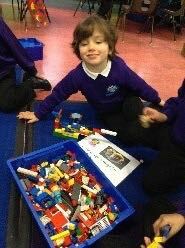 We’ve used lego and other construction materials to build beautiful castles and carriages for the Prince, Princess and Puss. 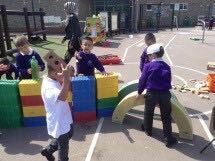 Outdoors we’ve been learning about height and making tall and short castles and towers with blocks, pebbles and sand. 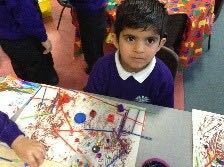 Literacy: We’ve been working on our Red Riding Hood story mapping this week and learning more about the characters. 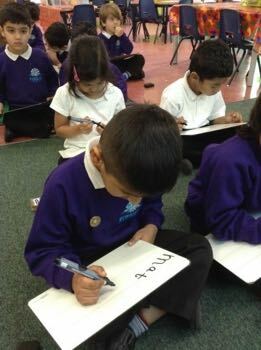 Phonics: This week we have been learning the sounds f and e and have begun trying to write simple words. Try and see if your child can write or read fog, get, set, met, fin, fat. Maths: In maths this week we have started to compare quantities. 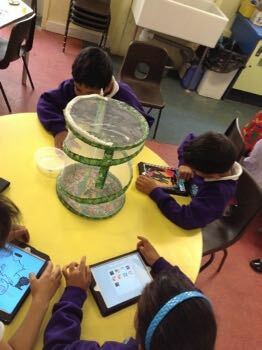 We have been using more and fewer/less to help us explain when we are comparing, e.g this basket has more sweets as it has 6 sweets and the other has 2. 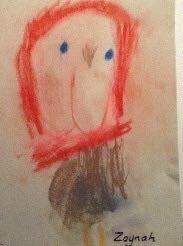 Creative and outdoors: This week we’ve looked at a very old painting of Red Riding Hood by Fleury Francois Richard. 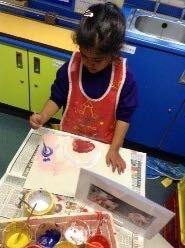 We looked carefully at how the artist portrayed her and then drew and painted our own pictures. 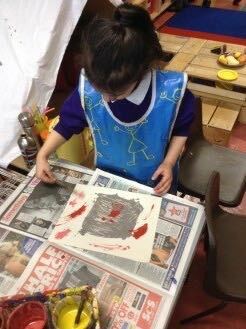 We also thought about how Red Riding Hood reacted when she saw the wolf in Grandma’s bed, and then acted out this scenario. 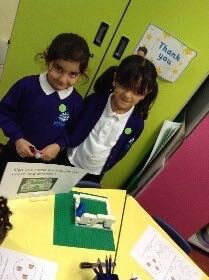 We used lego and other construction materials to build a safer house for Grandma and Red Riding Hood. Literacy: In literacy this week we have been reading ‘Little Red Riding Hood’. 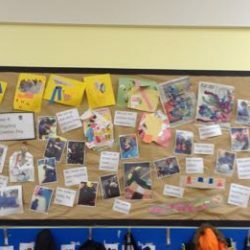 We have made a class story map which is in your children’s learning log, see if you child can retell the story. Phonics: This week we have been learning the sounds u and b and have begun trying to write simple words. 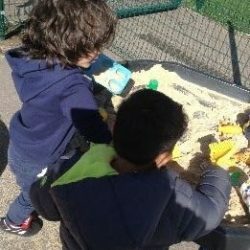 Try and see if your child can write or read sun, big, bad, bug, bin, up and mud. Maths: We have continued to recap numbers and how to form them correctly. 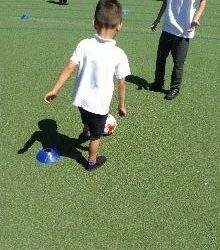 We have also been introduced to positional language this week and have been using language such as next to, on, under and behind. 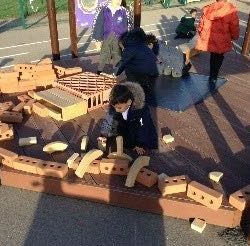 Creative and outdoors: On Monday we created pictures and models of the houses of parliament, both in our classrooms and outside. 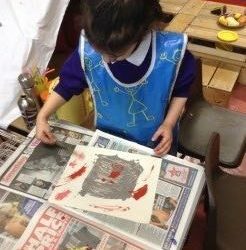 We’ve also been having fun acting out the story of Little Red Riding Hood and drawing, painting and making models of the story characters. 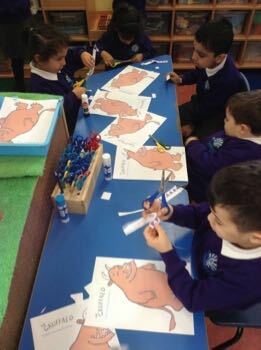 Literacy: This week we are continuing the story of ‘The Three Little Pigs’. 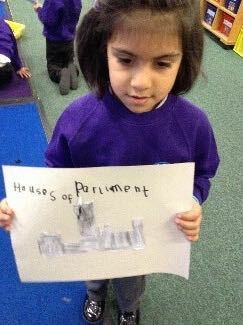 The children are beginning to create their own story maps by sequencing key parts of the story. Phonics: This week we have been learning the sounds c and k and have begun trying to write simple words. 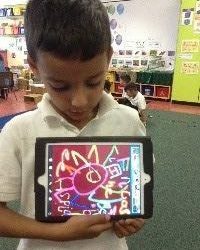 Try and see if your child can write or read cat, cog, kit, and kin. 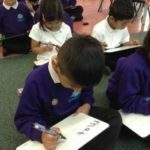 Maths: We have continued to work on our number recognition and writing this week. We have also been matching numerals to quantity e.g. 4 is the same as 4 cubes. 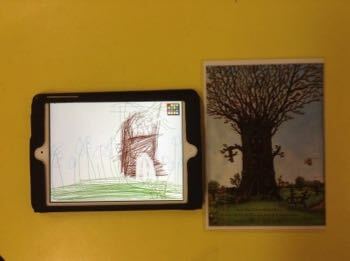 Creative and outdoors: We’ve been drawing the three little pigs and the big bad wolf on our ipads. 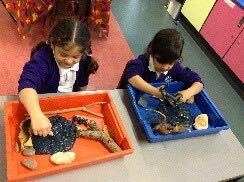 It was fun to make up our own stories using the three little pigs and their very own muddy patch. 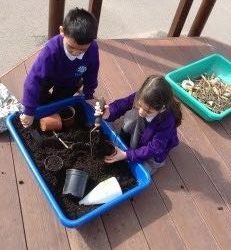 Outside we’ve been working on capacity, and filling and emptying different sized containers. We also had to rebuild the little pig’s house when the big bad wolf blew it down! 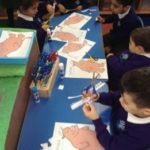 Literacy: The week we have been looking at the story of ‘The Three Little Pigs’. 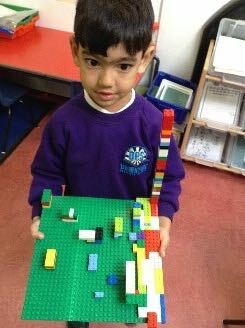 We have created a story map to help us retell the tale of the three pigs. Can your child tell you who the main characters are and what happens to the pigs in the story? Phonics: This week we have been learning the sounds g and o and have begun trying to write simple words. Try and see if your child can write or read got, dog, pog, gap, tig. 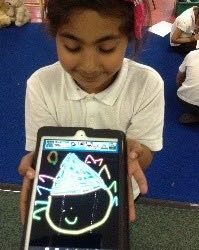 Maths: In maths this week we have been recapping 2D shapes (square, rectangle, circle and triangle.) 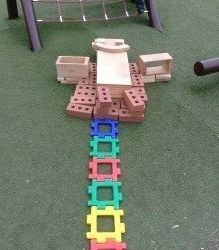 We have used these shapes to make houses, just like those in our story. 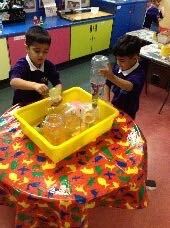 We have also started talking about capacity and have been using full, half full and empty. 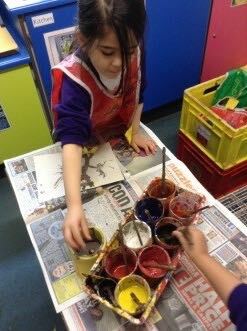 Creative and outdoors: We’ve been making models of the big bad wolf and mixing colours to paint the three little pigs. 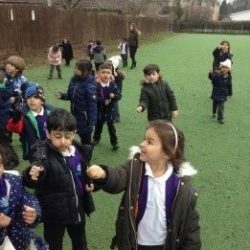 Outside we have been acting as the story characters and singing the song “Who’s afraid of the big bad wolf?” We’ve also been blowing bubbles by huffing and puffing just like the wolf did! 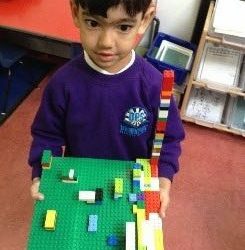 Maybe you could make a lego or duplo brick house with your child at home so that the little story pigs could be safe inside. 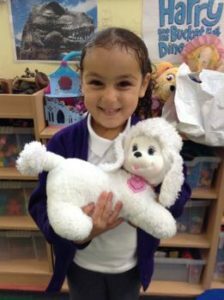 Literacy: This week we have continued ‘Goldilocks and the three Bears’. 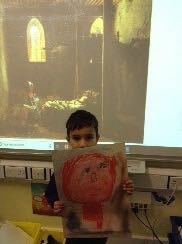 The children have been learning to understand how a character is feeling through the pictures and the text. Phonics: This week we have been learning the sounds n and p and have begun trying to write simple words. 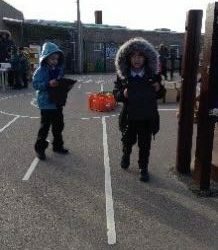 Maths: We have been revising size this week and have been learning about shapes. We have been introduced to a square, rectangle, triangle and circle. 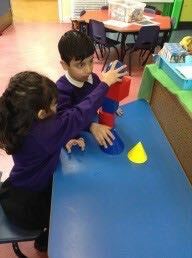 In our classrooms we spent some time spotting different shapes. 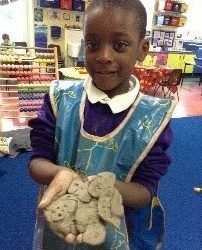 Creative and outdoors: This week we’ve been making the characters of Goldilocks and the three bears from clay and other materials. 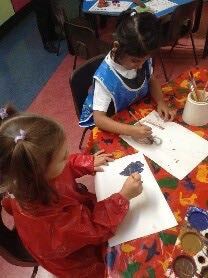 We’ve also been learning how to mix shades of brown in order to paint a real brown bear. Did you that bears have two layers of fur, which is why they look shaggy? 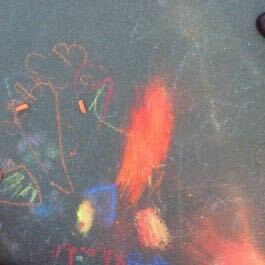 We’ve also been thinking about the colours of Autumn leaves and mixing paint outdoors in puddles! Literacy: This week we have started reading ‘The Three Bears’ with have looked and explored vocabulary to help us understand the text. Then we began to Story Map the book, see if your child can remember any of the story. 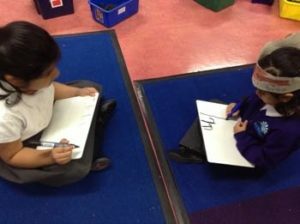 Phonics: This week we have been learning the sounds t and i and have begun trying to write simple words. Maths: We have been revising number this week and been introduced to size. 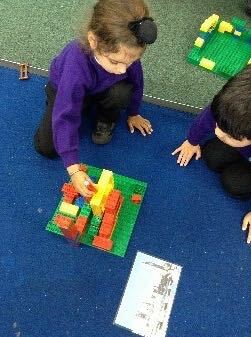 We have spoken about the size of the bears in our story and have been using words such as bigger, biggest, smaller and smallest. 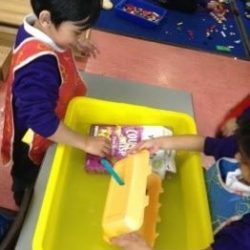 Creative and outdoors: We’ve been making new furniture for the bears after naughty Goldilocks went into their house and broke Baby Bears chair. 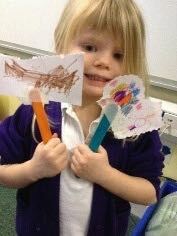 We’ve also been making puppets of the story characters and acting out the story. 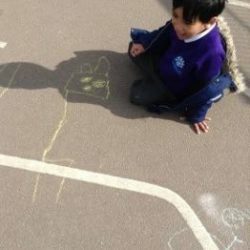 Both In our classrooms and outside, we’ve been drawing and painting the different sized bears and Goldilocks. 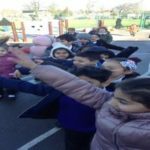 Literacy: This week in literacy we have been learning all about rhymes and rhyming words. See if your children can tell you what rhymes with cat…? 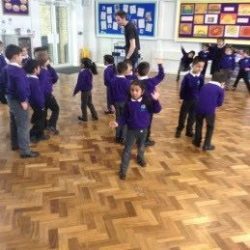 Phonics: Last week in phonics we were learning m and a. 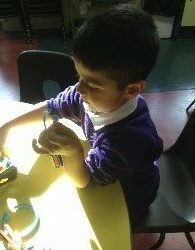 This week we have been learning the sounds s and d.
Maths: We have be learning to count up to 6 objects this week. 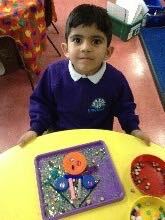 We started off by learning how to count carefully and have continued the week by counting Numicon, different objects and the characters for Once Upon a Time. 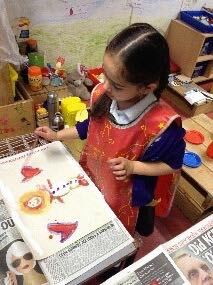 Creative and outdoors: This week we’ve been making pictures of ourselves as fairy tale princes and princesses. We’ve been playing with story characters and also drawing and painting them. 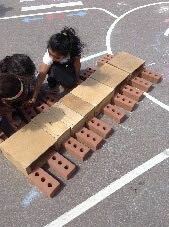 Both outside and in our classrooms, we’ve been using numicon to help build our mathematical understanding. 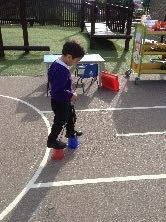 We’ve also been enjoying practicing and developing our our balancing skills. 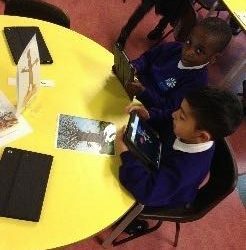 Literacy – This week we have started reading ‘Once Upon a Time’ by John Prater. 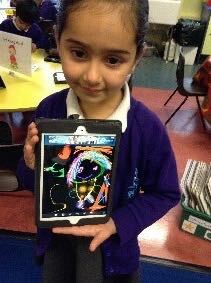 We looked at what an author and illustrator does and the different features of a book. 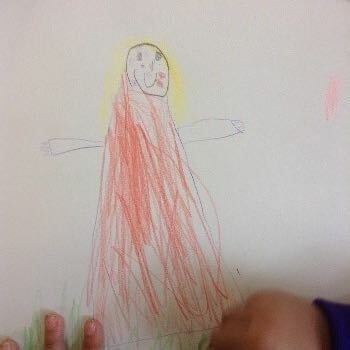 We have also looked at what we look like and started to describe ourselves for example ‘I have brown hair’. 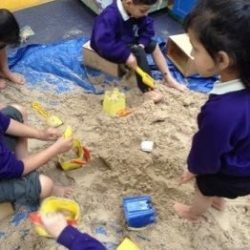 Phonics – In phonics we have been learning to listen to sounds in the environment and instrumental sounds, being able to say what the sound is. We have also been listening for the first sounds in our name. 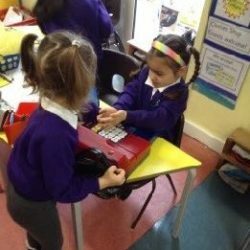 Maths – We have be learning all about numbers this week. Each day we have looked at a different number and learnt to write it. 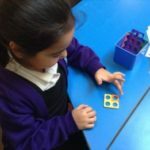 We have been exploring Numicon and how we can use it. 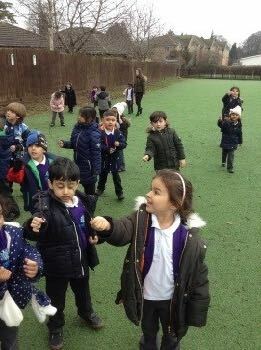 Outdoor and Creative – We have been learning to play ring games and have continued to explore our Reception playground. We have enjoyed dressing up as some of the characters. We’ve also been drawing and painting these characters. 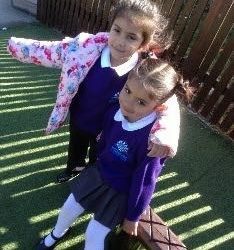 All the Year R teachers have been very pleased with the way our new children have settled into full time school. 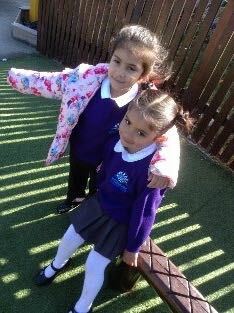 They look very smart in their school uniforms! 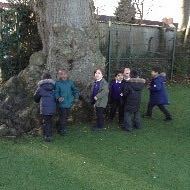 The children have been busy learning new rules and routines and exploring their new environment. Luckily the weather has been really sunny, so they have enjoyed playing outside in the playground and making new friends. 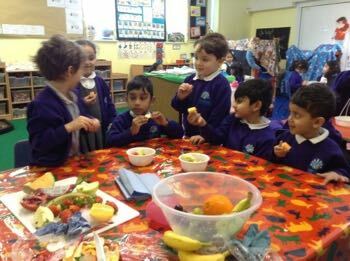 Children have enjoyed choosing and eating their school lunches in the hall, and are able to sit next to friends who may be in different classes. 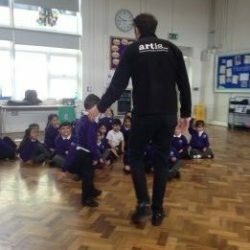 Everyone has had their first music lesson with Mr Guy, the music teacher, and next week the children will begin their PE lessons. Literacy This week we have been learning facts about Spiders and have created a class fact map. 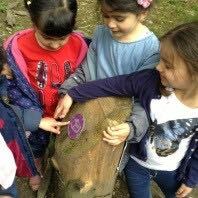 Try asking your child what they know and what they have learnt, such as; Spiders can live almost anywhere. All spiders have 8 legs. Some spiders spin webs to catch their prey. Spiders eat lots of different animals. 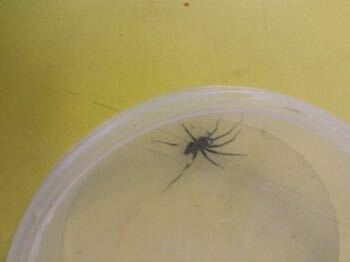 Did you know Black Widow spiders eat the male spiders? In Miss Dinham’s and Ms Coca’s class we have been continuing to learn how to write compound words. In Mrs Hicks’s class we have been revising all the sounds we have learnt. 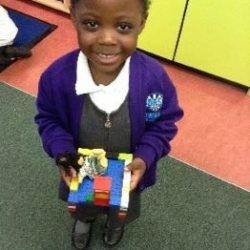 In Miss Harrison’s class we have been revising all the sounds we have learnt. 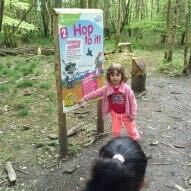 In Mrs McIntyre’s class we have been learning the digraph ‘sh’. 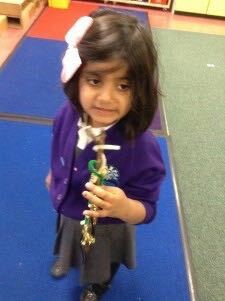 In Mrs Shabbir’s group we have been revising all the single sounds and using them in cvc words. 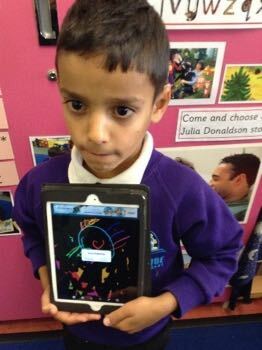 Maths We have continued to revisit our previous learning. 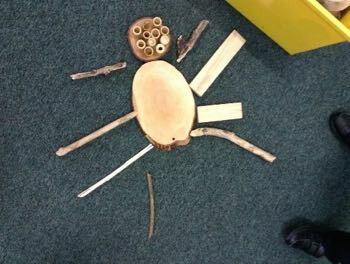 We have also been making spider models using shapes. 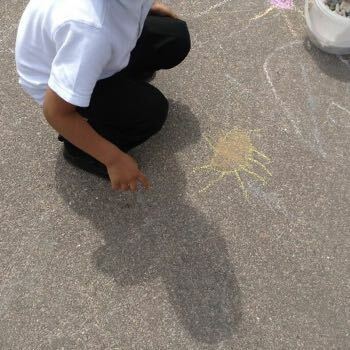 Outdoor, Creative and UW We’ve been observing real spiders and drawing from our observations. 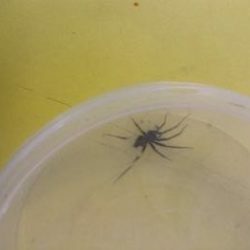 We’re amazed at how fast a tiny spider can move and also at how still they can stay. 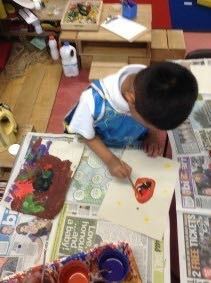 We’ve also been creating spider paintings and models! 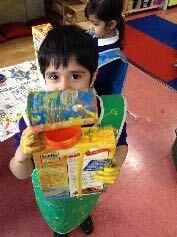 Literacy We’ve been reading “The Very Busy Spider” by Eric Carle. In Mrs McIntyre’s class we have been revising single sounds; forming them correctly, listening for them in words and using them to create cvcc/ccvc words and short captions. 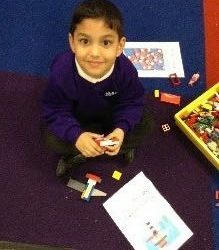 In maths we have learnt about time this week, as it features throughout the story. 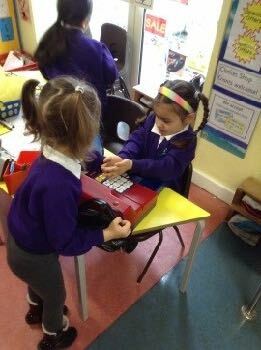 We have practised saying the time and looked at the hands on a clock. 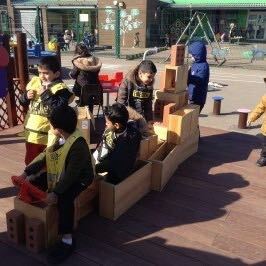 We have also been continuing to revise our previous learning. 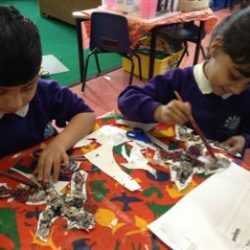 Outdoor, Creative and UW This week we’ve been learning about spiders and have been drawing, painting and making collages of them. 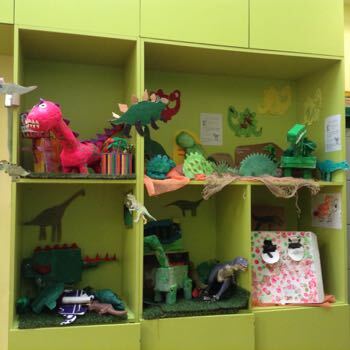 Look how our cutting and creative skills have improved since September! 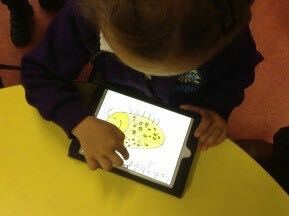 Literacy This week we have been reading ‘The Very Greedy Bee’ and discussed whether the greedy bee was being mindful or unmindful. 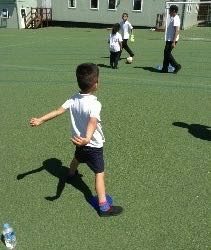 We have also joined in with the World Cup festivities and learned about one of the countries that have been playing for the World Cup, try asking your child about what they have learned. 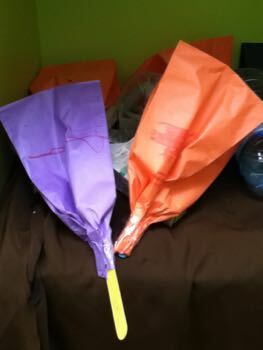 In Mrs Hicks’s class we have been revising air (fair) and igh (light). In Miss Harrison’s class we have been learning ‘oy’ as in boy. 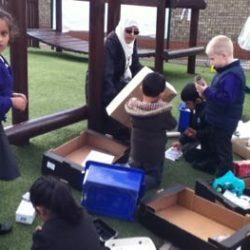 Maths We have been revisiting our previous learning in maths. 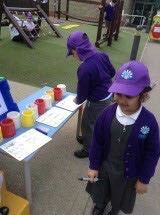 We have also been looking at word problems such as ‘there were 6 pots of honey and I gave 3 to my friend. How many are left now?’ and working out what number sentence we could write for the word problem. 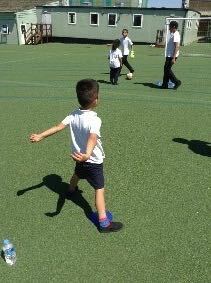 Outside on the field we had fun taking part in our own Reception World Cup afternoon, practising our football skills. 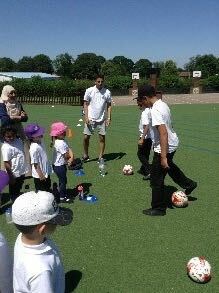 In our classrooms we each had a World Cup team and have been busy finding out about that team’s country and players. 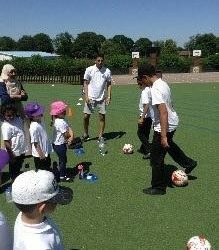 Lucky Crystal Class were given Portugal and drew and painted pictures of Cristiano Ronaldo, who is Portuguese, and one of the best football players in the world. 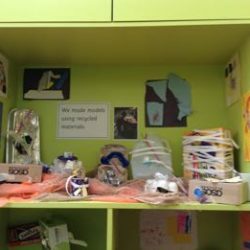 Look at the World Cup trophies that we made from recycled materials! Literacy We have been finding out facts about bees and then writing about them. 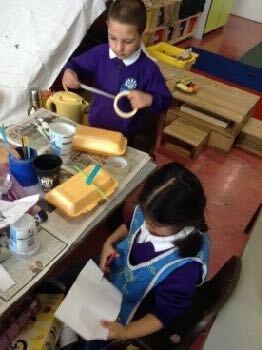 We also made and wrote about making honey sandwiches. In Mrs Hicks’s class we have been revising ay as in day, and oy as in toy. In Miss Harrison’s class we have been learning ou as in shout. In Mrs McIntyre’s class we have been revising the sounds v, w, x, and z; forming them correctly, listening for them in words and using them to create cvc words and short captions. Maths This week in maths we have been revising subtraction. We have been working out the answers for questions such as 8-5=3. We have also been using reasoning to check if our answers are right, for example we know the answer will be smaller than the first number when we subtract. 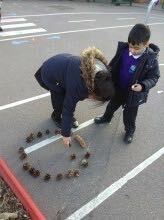 Outdoor and Creative Outside we’ve been learning about halving and sharing. 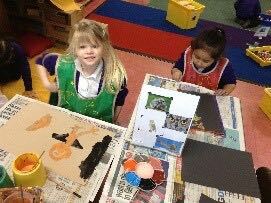 We’ve also been creating pictures and models of bees and butterflies. Our butterflies have hatched! It’s been really exciting watching them emerge and spread their beautiful wings. We then had to let them free, so that they could fly away and find somewhere to lay their eggs. We’ve been learning about bees and how they make honey. 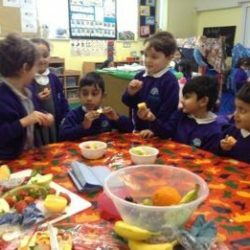 We’ve had fun making and eating honey sandwiches and taking about how honey is good for us. 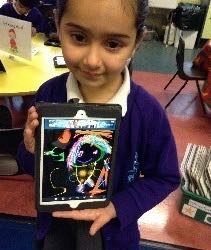 Literacy This week we have been reading ‘The Very Hungry Caterpillar’ by Eric Carle. 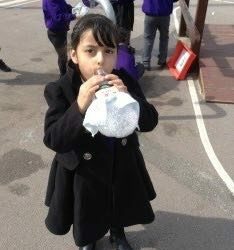 We have learn about healthy eating and other ways we can be healthy such as washing, sleeping and drinking plenty of water. 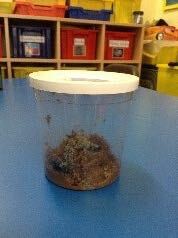 We have also continued to watch our class caterpillars grow and some are ready to become cocooned. 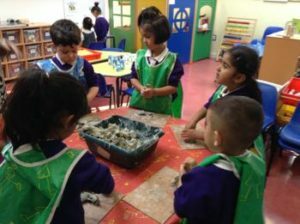 In Mrs Hicks’s class we have been revising ou (flour) and learning oy (boy). 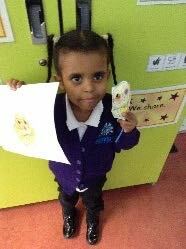 In Miss Harrison’s class we have been learning ir (bird) and using them in cvc words. 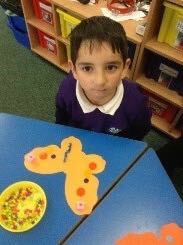 Maths As we have been learning about butterflies and caterpillars we have been learning about symmetry and creating our own symmetrical butterflies. 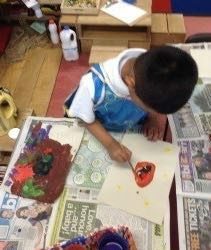 We have also been discussing the days of the week and what the Very Hungry Caterpillar ate on each day. 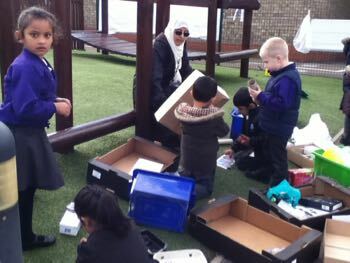 Outdoor Outside we’ve been drawing, painting and making models of the Hungry Caterpillar. 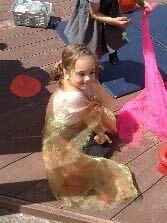 We’ve really enjoyed dressing up as beautiful butterflies and moving gracefully, as though we had their amazing wings. UW and Creative We have our very own caterpillars and are watching them grow larger every day. We’ve been using magnifying glasses to look closely at detail, and then drawing from observation. 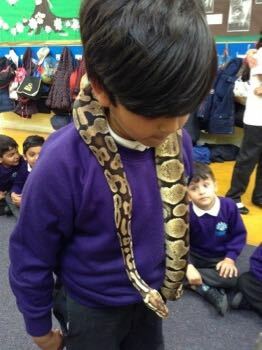 Literacy This week started with a wow. 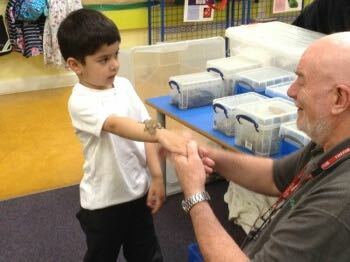 The children got to meet Walter ‘The Minibeast Man’ and meet some of his creatures and some even held them. 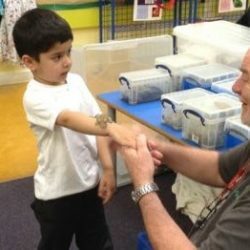 The children continued the week learning about caterpillars and butterflies and the life cycle. In Mrs Hicks’s class we have been revising ir (bird) and learning ou (flour). 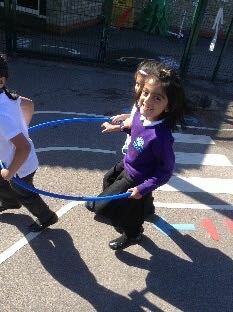 In Miss Harrison’s class we have been learning air (hair) and using them in cvc words. In Mrs McIntyre’s class we have been revising ascending sounds; forming them correctly, listening for them in words and using them to create cvc words. Maths As we have started to look at butterflies this week, we have been introduced to symmetry. We have explored this by creating symmetrical patterns on the wings of butterflies. 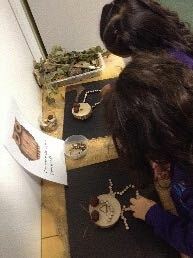 In class this week we have also continued to consolidate our previous learning. 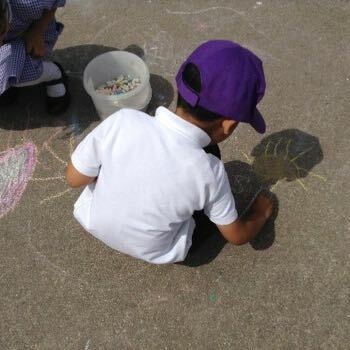 Outside we’ve been drawing pictures of long colourful caterpillars and beautiful butterflies. 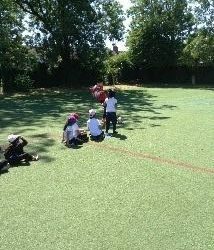 We’ve also been on the school field, hunting for minibeasts. We found ants, slugs, woodlice and lots of snails. 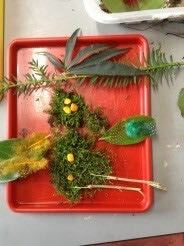 We also used natural materials to create a minibeast home. UW and Creative In our classrooms we’ve been creating models and pictures of Walter’s animals, such as the Giant African Land Snail. By Eric Carle. We began by looking at key words the children may not know and explaining them before reading. 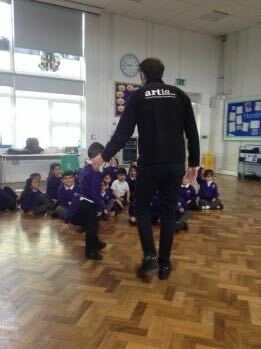 Then at the end of the week we dramatised the story to get a better understanding of the characters. 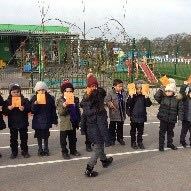 In Miss Dinham’s and Ms Coca’s class we have been learning how to write compound words with oo (broorm) (book), oo and ow (snow). 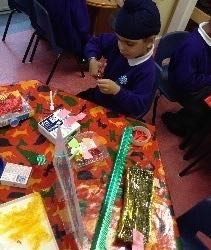 In Mrs Hicks’s class we have been revising air (hair). In Miss Harrison’s class we have been learning oo (book) and using them in cvc words. In Mrs McIntyre’s class we have been looking at the vowel sounds a, e, i, o and u; forming them correctly, listening for them in the middle of words and using them to create cvc words. In Mrs Shabbir’s group we have been revising all the single sounds and using them in cvc words such as cat, bin and ten. Maths In maths this week we have been looking at doubling. 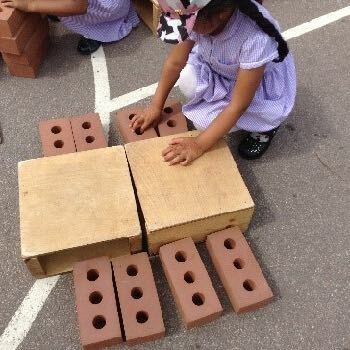 We have been exploring doubling with Numicon, doubling the spots on ladybirds and finding doubles on dominos. 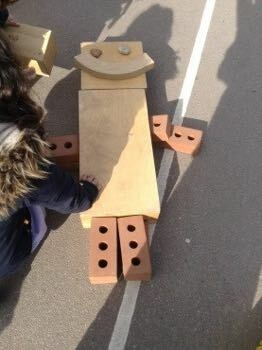 Outdoor Outside we made a giant ladybird from wooden blocks. 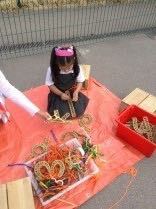 We’ve been improving our fine motor skills by weaving on number, letter and minibeast frames. We’ve also been sorting dominoes into doubles and non-doubles, and then writing the number sentence for each double domino. 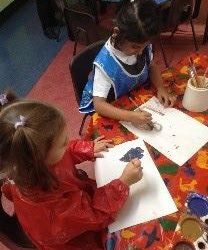 UW and Creative In our classrooms we’ve been drawing and painting both the bad tempered, and the friendly ladybird from our focus story. 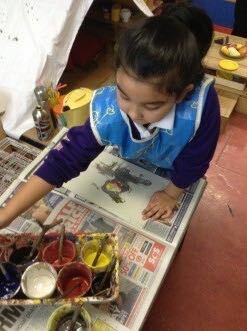 We’ve learnt how to paint on one half of the paper and then to fold it, so that we have a symmetrical ladybird with double spots. 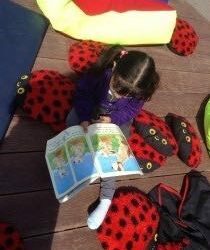 Literacy This week we have been learning all about ladybirds. We have created a fact map to help us write sentences about them, For example; Ladybirds live in long grass. They like to eat aphids. 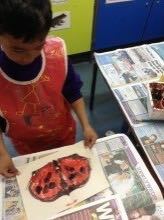 Ladybirds have wings and spots. 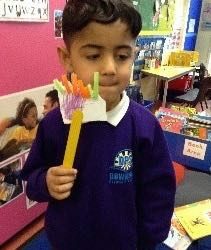 In Miss Dinham’s and Ms Coca’s class we have been learning how to write compound words with oo (broom) (book), oo and ow (snow). 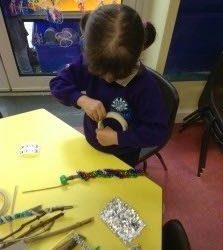 In Mrs Hicks’s class we have been learning air (hair). 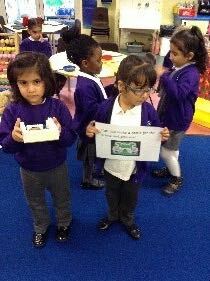 In Miss Harrison’s class we have been learning ar (car) and using them in cvc words. Maths During this week in maths we have been revisiting some of our previous topics. We have also been briefly introduced to doubling, a topic that we will be working on more next week. 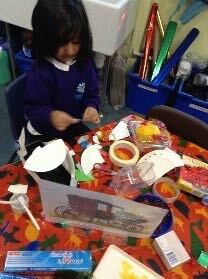 Look at the ladybird bus we made outside! 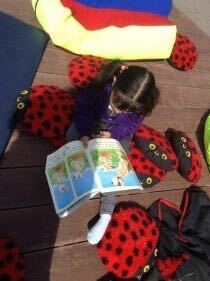 It’s been so warm this week that we’ve been sitting reading in the sunshine and relaxing on our ladybird cushions! 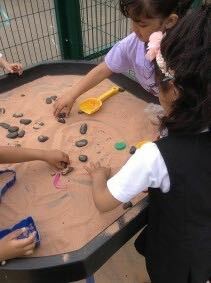 We’ve been drawing ladybirds with chalk and in sand, using black pebbles for spots. 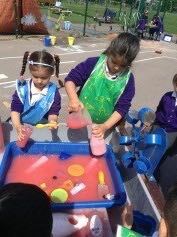 We’ve also been playing with red coloured water and having a pretend ladybird tea party! 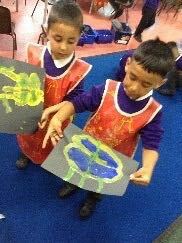 UW and Creative In our classrooms we’ve been drawing and painting ladybirds to use on our displays of minibeasts. 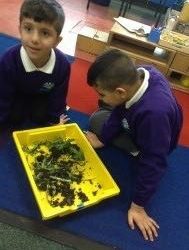 We’ve also been finding out about and writing more interesting facts about ladybirds. 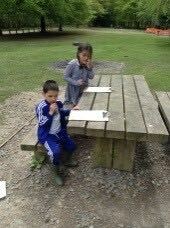 Literacy Last week we have been learning about and naming the different mini-beasts we have seen on our trip to Wendover Woods. Linked to the trip we revisited the Gruffalo and began reading ‘The Highway Rat’ by Julia Donaldson. 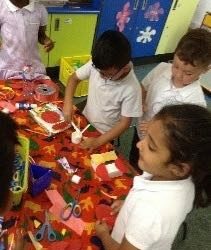 In Miss Dinham’s and Ms Coca’s class we have been revising all the sounds we have learnt. 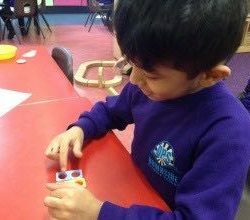 In Mrs McIntyre’s class we have been revising all the sounds; forming them correctly and using them to create cvc words. 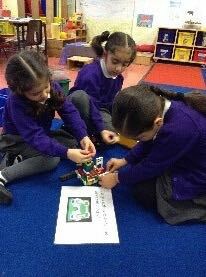 In Mrs Shabbir’s group we have been revising all the single sounds. Maths We have been working on counting on this week. When adding we have been learning to put the biggest number in our head and to count on from there. 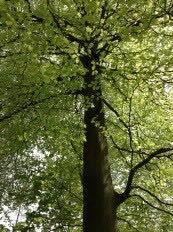 This week we’ve all been to Wendover Woods, where we’ve had great fun learning and exploring the natural environment. 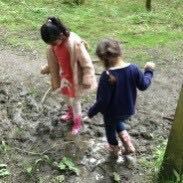 We especially loved making footprints in the mud, and were glad we wore our wellies! 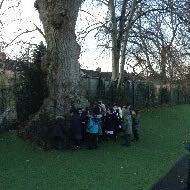 We took part in lots of activities, including looking really carefully at a tree and then drawing it. 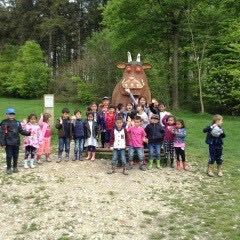 We were really excited when we found the Gruffalo! 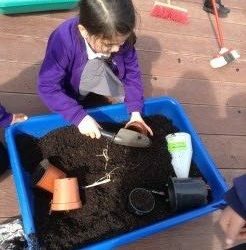 Literacy This week we have continued learning about worms through a fiction book called ‘Superworm’ by Julia Donaldson. 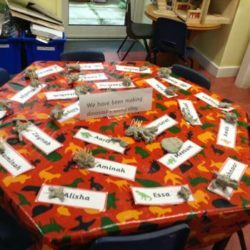 We began by looking at key words the children may not know and explaining them before reading. 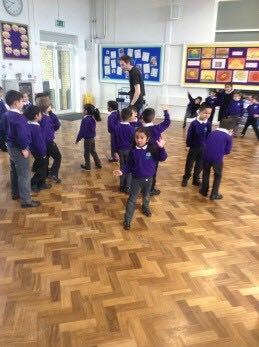 Then at the end of the week we dramatised the story to get a better understanding of the characters. 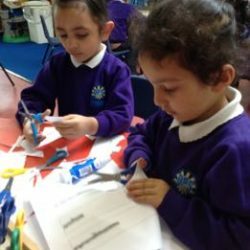 In Miss Dinham’s and Ms Coca’s class we have been learning how to write polysyllabic words (words with two syllables for example sandwich and blowfish. 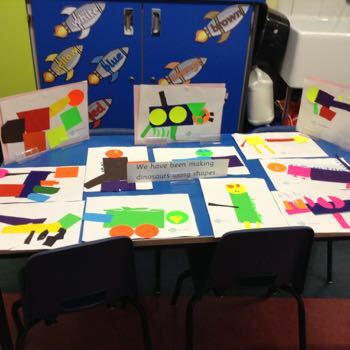 In Mrs Hicks’s class we have been learning ar (car) and revising all the other sounds. 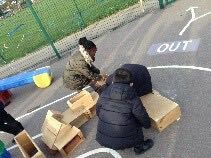 In Miss Harrison’s class we have been learning igh (light) and ow (snow) and using them in cvc words. In Mrs McIntyre’s class we have been looking at descending sounds p, g, f, j and y; forming them correctly and using them to create cvc words. 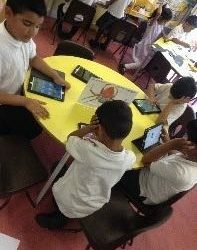 In Mrs Shabbir’s group we have been revising y, w and x.
Maths We have been continuing to work on subtraction this week within maths. To help us answer the question we have been drawing circles. 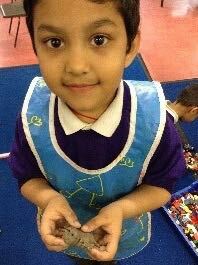 This week we’ve continued to have fun role playing scientists in our bug labs and minibeast research centres. We’re proud of our stick and googly eye Superworm models! 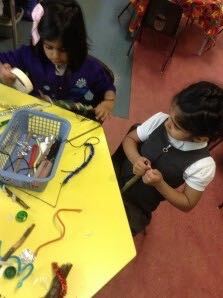 It was quite difficult to bend the pipe cleaners around the sticks, but we persevered! Outdoor and UW The weather’s been very showery this week, so we remembered that worms come to the surface when it rains and decided to go on a worm hunt! Did you know that worms always need to be wet or damp, and so they use the rainy weather as an opportunity to move overland, without risking their skin drying out. 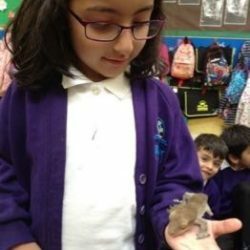 Literacy This term we are learning all about mini-beasts. 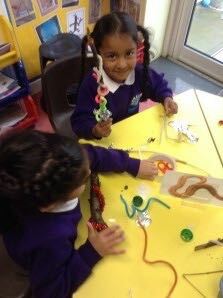 This week we have studied worms learning different facts through looking at non-fiction books and creating a fact map. Ask your child what facts they can remember about worms. 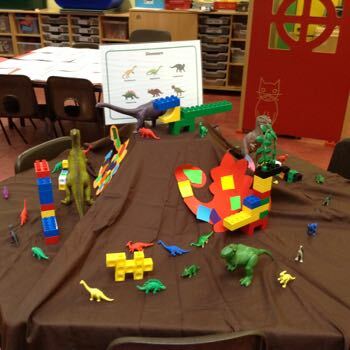 In Mrs Hicks’s class we have been learning oo (book) and revising oo (zoo) and all the other sounds. 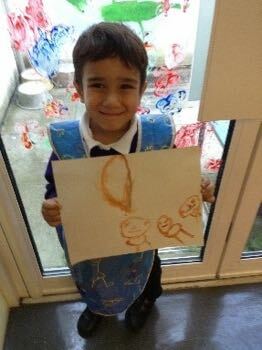 In Miss Harrison’s class we have been learning ee (see, bee) and using them in cvc words. In Mrs McIntyre’s class we have been looking at c shape sounds c, o, a, d and g; forming them correctly and using them to create cvc words. 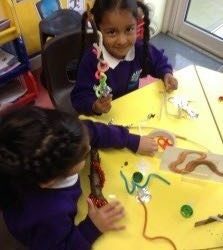 Maths As we have been learning about worms this week we have been investigating length. We have also started to look at subtraction and have been introduced to the subtraction sign. 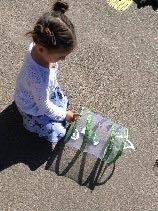 Outdoor and Creative We’ve had fun outside blowing bubble worms. 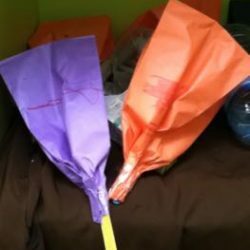 You need to blow very hard to make a long bubble worm. 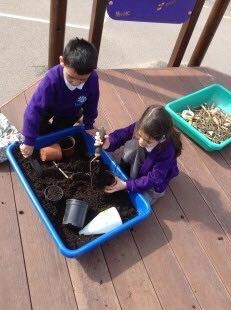 We changed our role play area into a garden and have enjoyed digging in the soil and planting seeds. 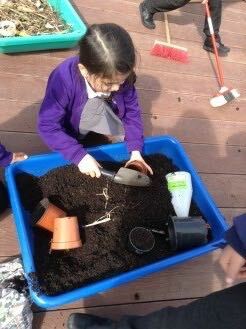 We now know that worms are very good for soil and are sometimes called gardener’s friends. 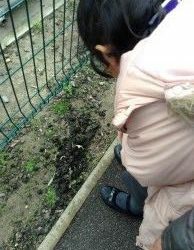 UW We’ve been observing and finding out about worms. Did you know that worms do not have lungs but use their skin to breathe? They have tiny hairs which help them to move. Literacy This week we have been learning about the different people who help us in the community. 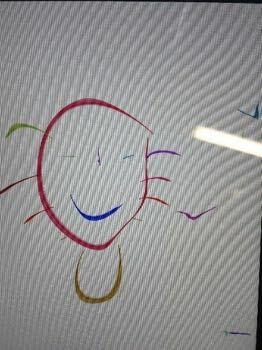 In Miss Dinham’s and Ms Coca’s class we have been learning the sounds ou (mouth) and oy (boy). In Mrs Hicks’s class we have been learning oo (zoo) and revising all the other sounds. In Miss Harrison’s class we have been learning ay (day) and using them in cvc words. 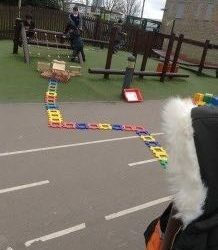 In Mrs McIntyre’s class we have been looking at ascending letter (tall) l, t, d, b and h; forming them correctly and using them to create cvc words. 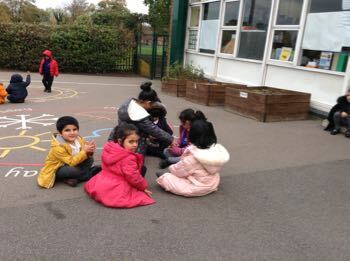 In Mrs Shabbir’s group we have been revising r, j and v.
Maths This week in maths we have been looking at subtraction. We have learnt that subtraction means we are taking away and the number get smaller. 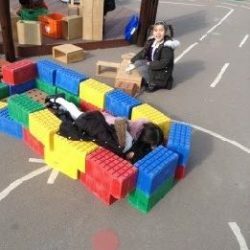 We have been doing this practically with cubes and pictorially. Outdoors we drew fire pictures on the floor and created our own fire engine so that we could put out the fires safely! 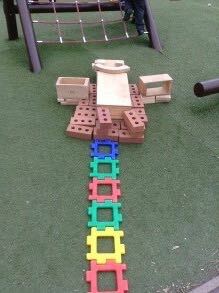 Look at the long road we made for George to hop along, so that he could reach the shop and find his old clothes! 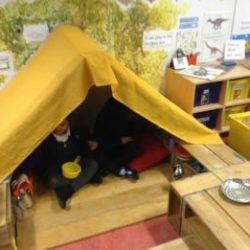 Literacy This week we have been reading ‘The Smartest Giant in Town’ and have learnt some new words such as campsite, howling, shiver and bog. 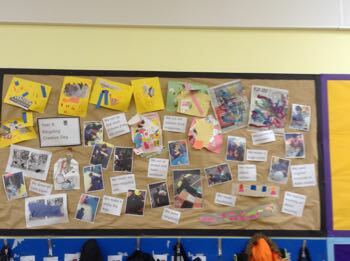 After reading the story we created a story map with actions…see if I can remember any of the story over the weekend. 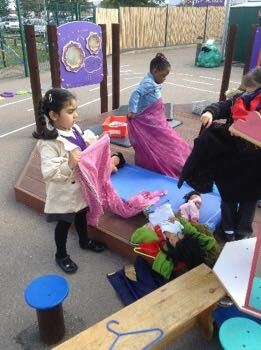 Outdoor This week we’ve been role playing the story of “The Smartest Giant” outside, and singing his happy song. 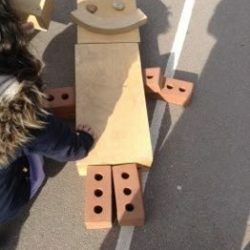 We’ve also been drawing the tall giraffe on the ground, and using blocks and bricks to create models of the giant. 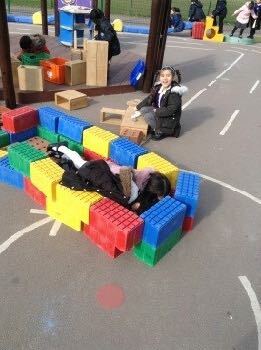 We also made a huge bed for the giant, as he got very tired from hopping all the way back to town. 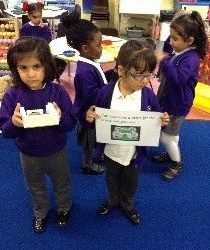 Creative We’ve had great fun learning about money and playing in our classroom clothes shops, either as shopkeepers or customers. 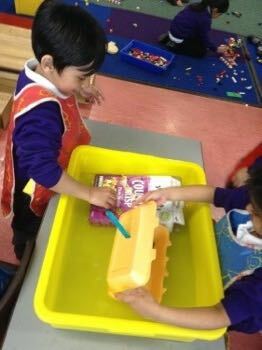 UW We’ve been making boats for the goat in the story and then testing them to see if they float. 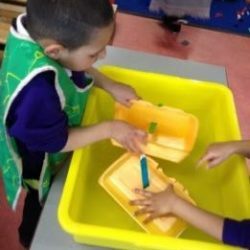 Literacy This week we have been looking at different types of water such as river, lakes, ponds and the sea and discovering what creatures live there. 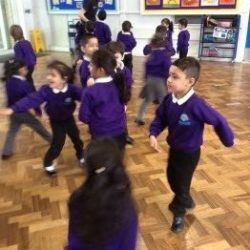 In Miss Dinham’s and Ms Coca’s class we have been learning the sounds air and ir. 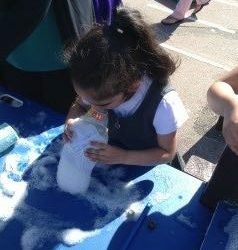 In Mrs Hicks’s class we have been learning ow (snow) and revising all the other sounds. In Mrs McIntyre’s class we have been revising w, x and z; forming them correctly and using them to create cvc words. In Mrs Shabbir’s group we have been revising e, l and h.
Maths We started off this week recapping adding and understanding that the answer gets bigger. 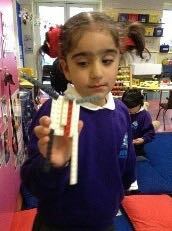 We then moved on to estimation and applied it to working out how long or tall something is. 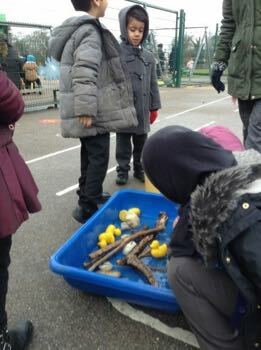 Outdoor Outside, we went onto the field to look at the trees and to find sticks and twigs that we could use for our Stick Men. 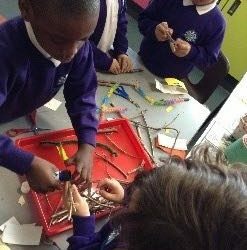 We noticed that some sticks were flexible, and some were brittle and broke when we tried to bend them. 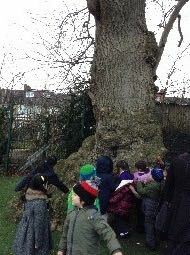 Some were smooth and some were knobbly and bumpy, and some even had little prickles on them! 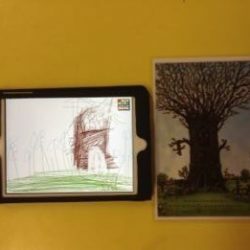 We learned about Stick Man’s adventures through all the seasons and then drew Stick Man’s tree home and his family on our ipads. We were so glad that he managed to get home again! One of the places that Stick Man journeyed to was a beach, where he was used as a mast for a flag. 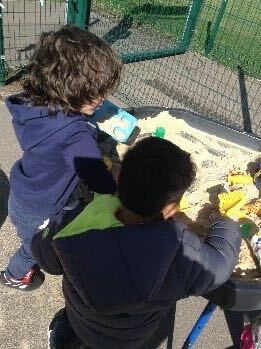 This week we’ve had lots of fun playing in our own beach area and making sandcastles. Literacy Over the next two weeks we are reading the book ‘Stick Man’ by Julia Donaldson. This week we are focusing on some new words from the story and looking carefully at how Stick Man would talk throughout the story using drama. 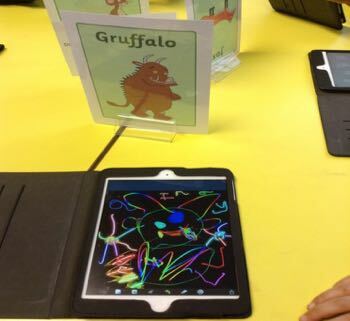 In Miss Dinham’s and Ms Coca’s class we have been consolidating the sounds ar and or and learning the sound ng. In Mrs Hicks’s class we have been learning igh and revising all the other sounds. In Miss Harrison’s class we have been revising ch and th and using them in cvc words. 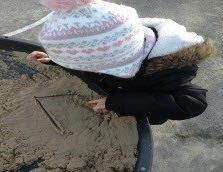 In Mrs McIntyre’s class we have been revising j, v, y and w; forming them correctly and using them to create cvc words. In Mrs Shabbir’s group we have been revising u, b and f.
Maths During maths this week we have been recapping 1 less and learning about length. 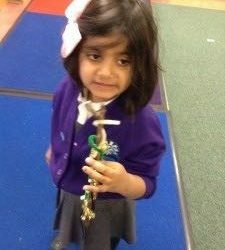 We have been comparing sticks and discussing which ones are longer and which are shorter. 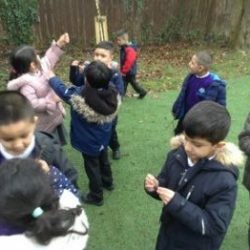 Outdoor We’ve been acting out the Story of Stick Man in our playground. 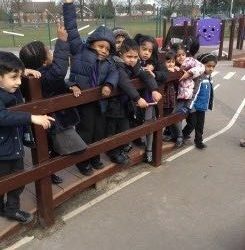 Here we are standing on the bridge and throwing Pooh sticks into the river! 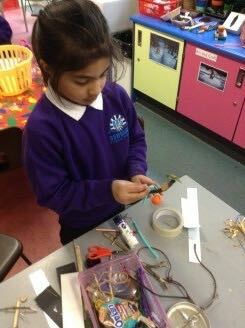 Creative and UW We’ve been making our own Stick Men, using sticks and other materials. 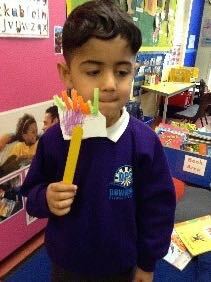 We had to think carefully about the best way to join the sticks that make up his body. 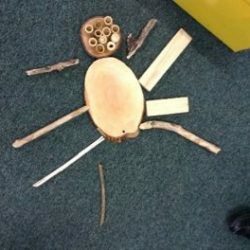 The Year R. teachers would love the children and their parents to try making a Stick Man at home, and then bring him to school to show everyone. Literacy Over the next two weeks we are reading ‘The Gruffalo’s Child’. 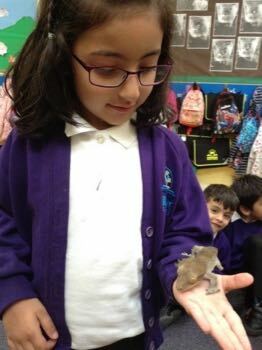 This week we have been working on descriptive language by describing the mouse in different ways. 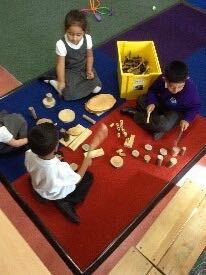 In Miss Dinham’s and Ms Coca’s class we have been consolidating the sounds oo (e.g. zoo) and oo (e.g. book). In Mrs Hicks’s class we have been learning ay and revising all the other sounds. In Miss Harrison’s class we have been learning sh and revising all the other sounds. In Mrs McIntyre’s class we have been revising b, f, e and l; forming them correctly and using them to create cvc words. This week in maths we have been revising shapes. We recapped 2D shapes (square, circle, triangle and rectangle), then we looked at 3D shapes (Cube, cuboid, cylinder, cone and sphere). 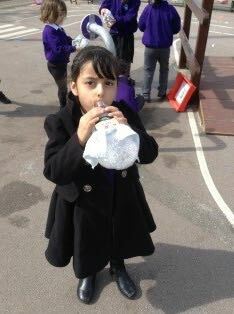 Outside we’ve been having fun experimenting with blowing bubbles. 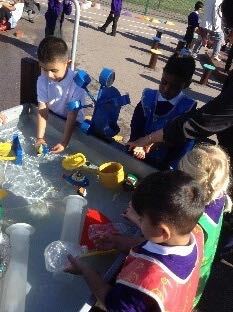 We used different shaped bubble wands and discovered that whatever the shape of the wand, the bubbles we blew were always spheres. 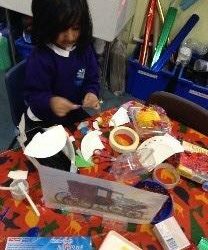 Can you see all the different 3D shapes that we used, in making this model of the Gruffalo’s Child? 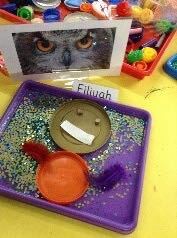 Creative and UW The owl in the story of “The Gruffalo’s Child” has beautiful and very soft feathers. Feathers are fascinating when you look closely at them, using a magnifying glass. 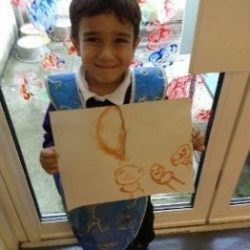 We’ve been observing feathers this week and drawing what we feel and see. Literacy – In topic we have been learning about other creatures that live in similar habitats to the animals in the Gruffalo. 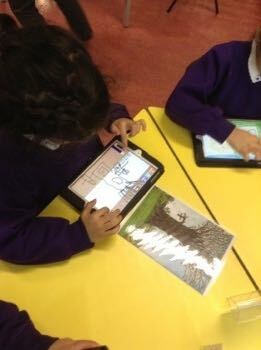 We then used what we have learned and replaced the characters of fox, owl and snake in our story of the Gruffalo. 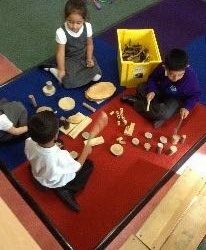 In Miss Dinham’s and Ms Coca’s class have been consolidating the sounds ee and ay. 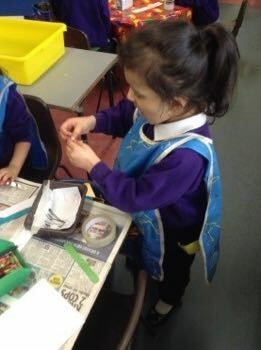 In Mrs Hicks’s class have been learning th and revising all the other sounds. In Miss Harrison’s class have been revising v and j and using them in cvc words. In Mrs McIntyre’s class have been revising I, n, p, and g; forming them correctly and using them to create cvc words. 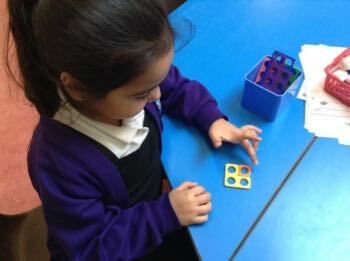 In Mrs Shabbir’s group have been revising n, p and g.
Maths – This week in maths we have been continuing to work on addition and have been using numicon to support us. 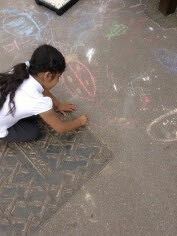 We have also been practising writing number sentences alongside this. 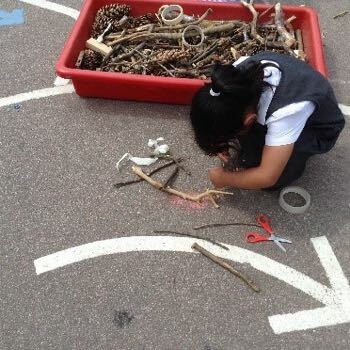 Outdoor – Outdoors we’ve been using natural materials such as pine cones and sand, to create 2D shapes. Creative – We’ve been using natural materials to create pictures of the Gruffalo and some of the animals that live in woodland areas. 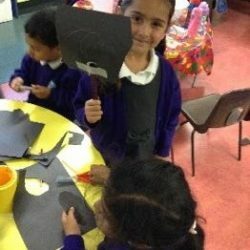 UW – We’ve been finding out about woodland animals such as the badger. Did you know that the name badger comes from the French word ‘bêcheur’, which means “digger”? 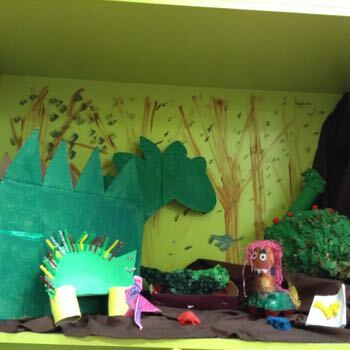 Literacy – This week in topic we have been looking at the wonderful, imaginary food from the gruffalo. From this we have made scrambled eggs and a healthy fruit salad. Why not try it at home? 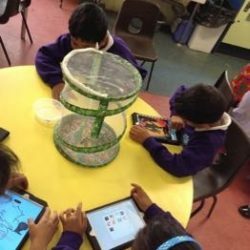 Phonics – In Miss Dinham’s and Ms Coca’s class we have been consolidating the sounds ch, sh and th. In Mrs Hicks’s class we have been learning ch and revising all the other sounds. In Miss Harrison’s class we have been revising y and w and using them in cvc words. In Mrs McIntyre’s class we have been revising the first 5 sounds, m, a, s, d, t, forming them correctly and using them to create cvc words. 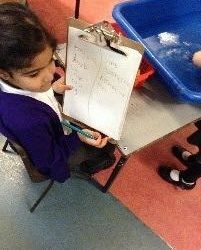 In Mrs Shabbir’s group we have been revising d, t and i.
Maths – We have been looking at adding this week and have been introduced to the addition sign. 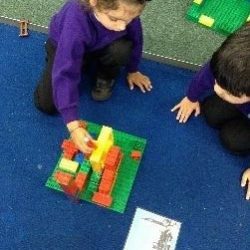 In pairs we have been adding cubes together to find the total. 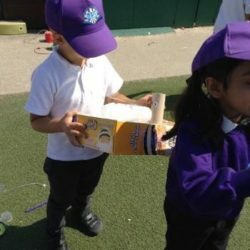 Outdoor – We’ve been using everyday language to talk about weight. 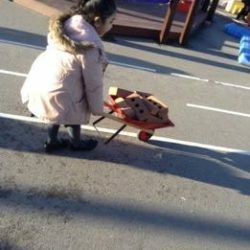 This wheelbarrow full of bricks is very heavy! 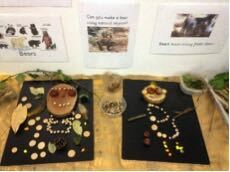 Creative – In our role play areas we’ve been cooking funny foods such as scrambled snake and roasted fox! 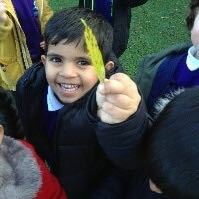 UW – This has been an exciting week in Reception, as we’ve talked about the kind of food the Gruffalo likes to eat and the kind of foods that are healthy for us to eat. We’ve cooked Gruffalo crumble and made fruit salads. 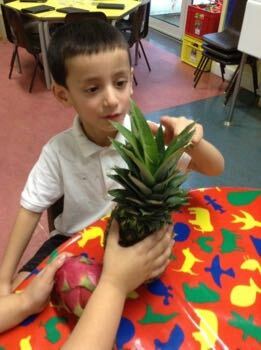 Besides the kind of fruit we already know well, we’ve found out about more exotic fruits such as dragon fruit and pineapple. 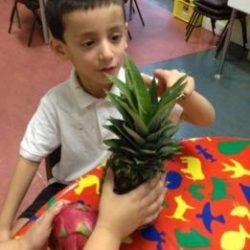 The pineapple felt rough and spiky like the Gruffalo’s purple prickles! 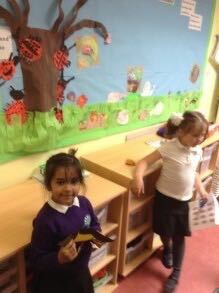 In topic this week we have been learning about the different animals from the Gruffalo; what they look like? where they live? what they eat? and how they move? 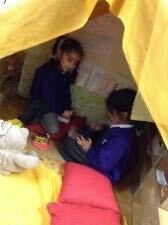 This week we have started our new phonic sets and are continuing to read and write words. We are also beginning to use what we have learnt and apply it to sentences. In maths lessons we have been learning how to find the total of 2 groups. 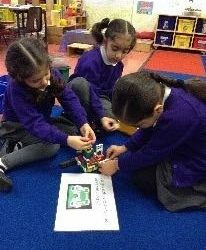 We have used cubes and numicon to help us work out the total of two different groups in order to find out how many we have altogether. After reading the Gruffalo this week we went outside and have been moving as the different story characters. 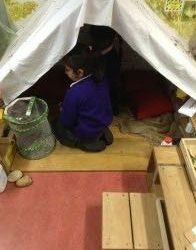 We’ve also been building dens or homes for the Gruffalo and the animals. 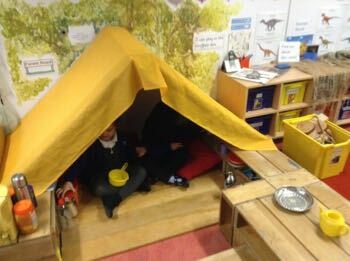 This week we have been playing in the Gruffalo den and acting out the story. 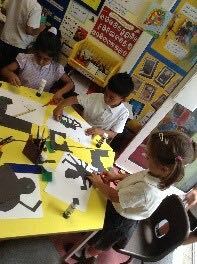 We’ve been thinking about the Gruffalo’s features and have drawn, painted and made models of him. 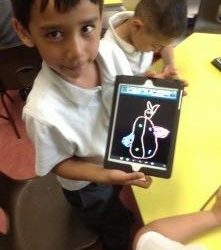 We’ve been finding out about all the animals in the Gruffalo story and have used ipads to draw them. In Literacy we focused on Goldilocks and the Three Bears. 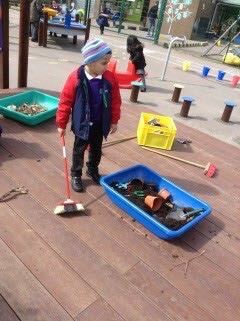 We found out how Goldilocks went to the Three Bears house without permission. She ate the bear’s porridge, broke the chair and slept in their bed. She wasn’t very nice. We wrote apology letters to the bears from Goldilocks to make up for all the things she did wrong. Next time Goldilocks promises to be good. When we went to the bear’s cottage we waited until we were invited inside. 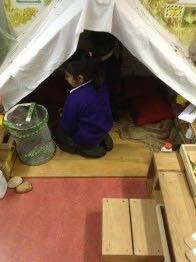 Our friends changed their voices to pretend they were the bears and asked us to come in and share their porridge. We found some bears and counted them to make sure we had three bears for our number work. 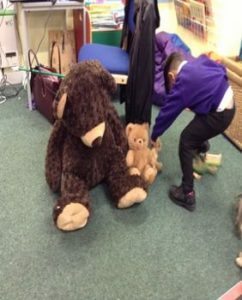 We also made sure they were three different sizes – a small bear, a bigger bear and a bear that was the biggest. Next we found bowls, chairs and beds of varying sizes for them. When our friends came to join us we matched the correct bear to the correct size bowl, chair and bed. We have learnt the u and b sound during our phonics lessons. 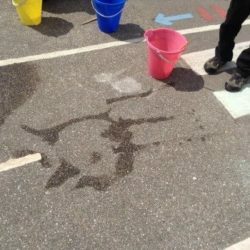 To help us write the u, we were shown a card with an umbrella on it and said the phrase: down and under, up to the top and draw the puddle as we wrote it. 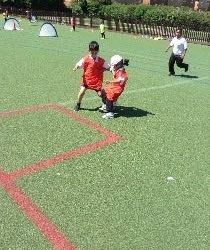 To remember the b, we were shown a picture of a boot and said the phrase: down the laces to the heel, round the toe. 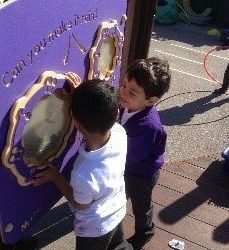 We are also learning to recognise tricky words – these are words we cannot use our sounds to blend. Our tricky words this week are he and she. 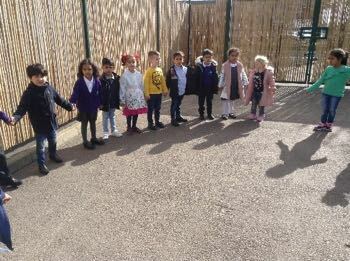 Outside we learnt a new song about the Three Bears. 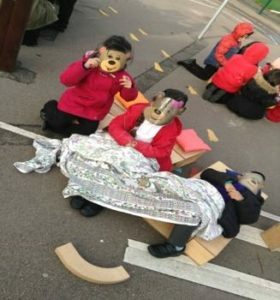 We moved around as the bears. Big steps as Daddy Bear, medium steps for Mummy, little tiny steps for Baby Bear. 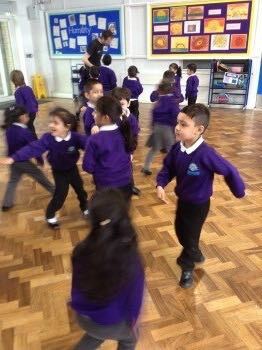 We used gestures to demonstrate which bears were eating the porridge – big movements for Daddy Bear, medium sized movements for Mummy Bear and smaller movements for Baby Bear. We climbed the stairs with big stomps, medium and small steps. 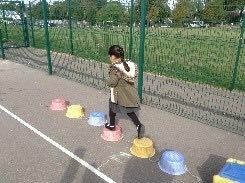 Then we chased after Goldilocks with big, medium and small strides. 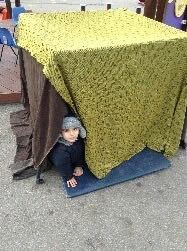 Later we used a variety of resources to make beds for the bears. 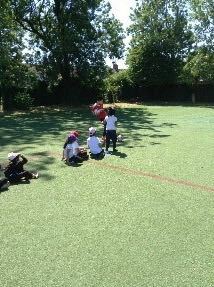 Then we pretended to be the characters and performed the story using the props we made. 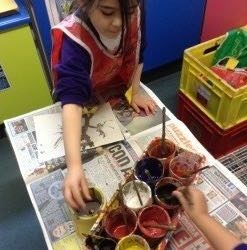 On our creative table we explored what happens to red, yellow and blue powder paint when they are mixed. We found it created a brown, so we decided to use this to paint one of the bears from the story. 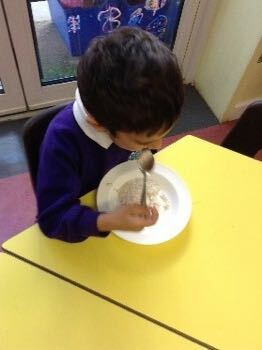 The bears like porridge and we wanted to try some. 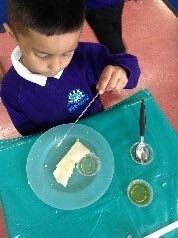 We had fun making it just like Mummy Bear and enjoyed tasting it. 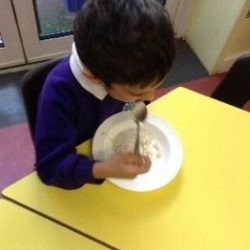 Some of us have never eaten porridge before and were very brave to try it. Unfortunately not all of us liked the taste but we were happy to try some. In Literacy we focused on Cinderella. 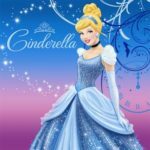 We found out how Cinderella went to the ball. 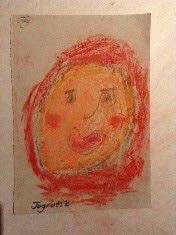 Her stepmother and two sisters were very unkind to her. They made her work so hard that was why she was dusting in Old Mother Hubbard’s house. 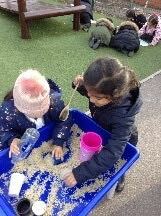 It is important we help each other especially after we have made a mess. 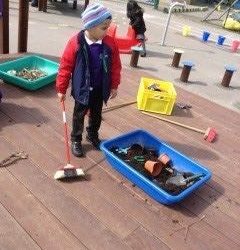 That is why; we all help to tidy up. Cinderella had to come back before midnight. In Numeracy we used our big clock and watch to learn about different times of the day and what we do at that time. 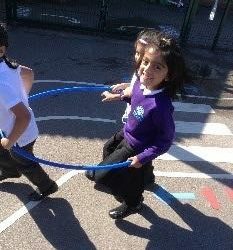 At midnight we are all asleep, it is very dark outside but at midday, we have our lunch and we play outside because the sun is out. 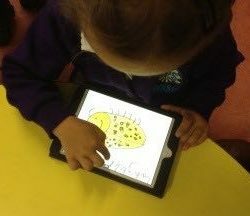 We have learnt the c, k and ck sound during our phonics lessons. To help us write the c, we are shown a card with a caterpillar on it and say the phrase: Curl around the caterpillar as we write it. 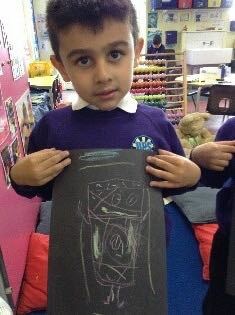 To remember the k, we were shown a picture of a kangaroo and say the phrase: Down the kangaroo’s body, tail and leg. 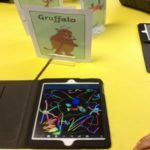 We are also learning to recognise tricky words – these are words we cannot use our sounds to blend. Our tricky words this week are, no, go and to. 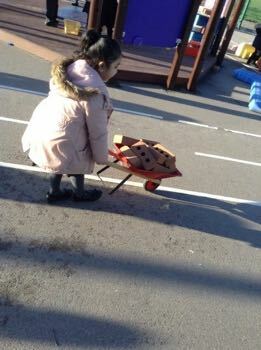 Outside we learnt to use the language of weight. We compared weight by saying whether objects are heavy or light. We felt Cinderella’s pumpkin to describe its weight. Then we were introduced to the large balance scales. Scales help us to measure weight. 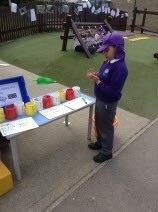 We pretended our arms were scales and had to predict which objects will be heavier before we felt them. 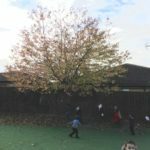 We went on an Autumn walk and collected leaves and used them to make autumn crowns. 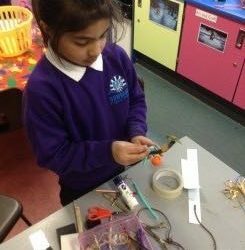 We had a range of activities that linked to the story of Cinderella such as wand making, crown making, designing Cinderella’s ball gown, drawing Cinderella and writing the characters names. We even pretended to go to the ball. We wore our wonderful clothes and danced! 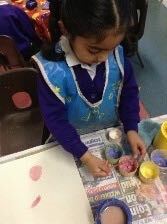 We have had great fun learning this week in reception. In literacy, we brought in our special toys. Then discussed why it was special to us. 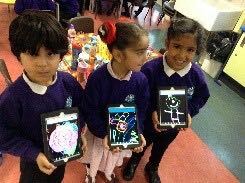 We used the iPad to take photograph of them. 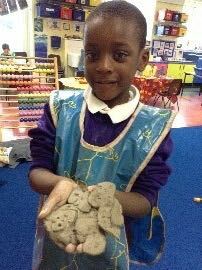 In our creative area we have been exploring clay. It felt nice and smooth. 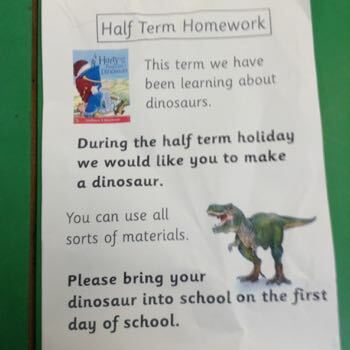 We enjoyed the experience and look forward to making dinosaurs with it. 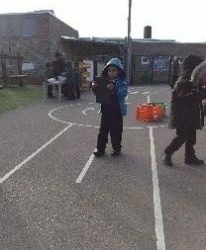 During our outside learning, in our maths lesson we learnt different sizes using the vocabulary large and small. 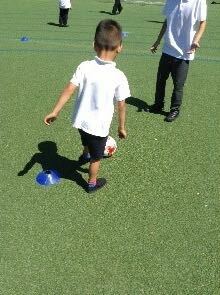 In our physical development session we learnt that it is better for us to run sensibly, looking where we are going. Also how to be a good friend and play nice games together. 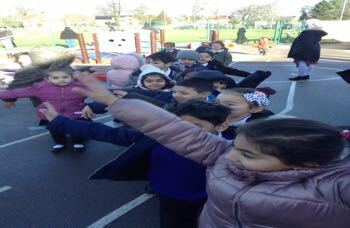 Every week in our phonics lesson we learn new sounds, this week we learnt the letter n and the letter p. To help us write the n, we say the phrase: down Nobby, over his net. To remember the p, we saw a picture of the pirate’s face and say the phrase: down the plait and over the pirate’s face.